In colon cancer screening, polyp size estimation using only colonoscopy images or videos is difficult even for expert physicians although the size information of polyps is important for diagnosis. To construct a fully automated computer-aided diagnosis (CAD) pipeline, a robust and precise polyp size estimation method is highly desired. However, the size estimation problem of a three-dimensional object from a single two-dimensional image is ill-posed due to the lack of three-dimensional spatial information. To circumvent this challenge, we formulate a relaxed form of size estimation as a binary-size classification problem and solve it by a new deep neural network architecture. This relaxed form of size estimation is defined as a two-category classification: under and over a certain polyp dimension criterion that would provoke different clinical treatments (resecting the polyp or not). Our proposed deep learning architecture estimates the depth map from an input colonoscopic RGB image using unsupervised deep learning, and integrates RGB with the computed depth information to produce a four-channel RGB-D imagery data, that is subsequently encoded as a pipeline to extract deep RGB-D image features and facilitate the size classification into two categories: under and over 10mm polyps. We collect a large dataset of colonoscopic videos of totally over 16 hours is constructed for the evaluation of our proposed method. Using this dataset, we evaluate the accuracies of both polyp detection and binary polyp-size estimation since detection is a prerequisite step of a fully automated CAD system. The experimental results show that our proposed method achieves 79.2% accuracy for binary polyp-size classification. We also combine the extraction features by our deep learning architecture and classification of short video clips using a long short-term memory (LSTM) network. Polyp detection (if the video clip contains a polyp or not) shows 88.8% sensitivity when employing the spatio-temporal image feature extraction and classification. The Chair for Computer Aided Medical Procedures (CAMP) would like to offer 4 research awards to strongly motivated international undergraduate students interested in improving their research skills in machine learning, medical imaging, computer vision and/or augmented reality. 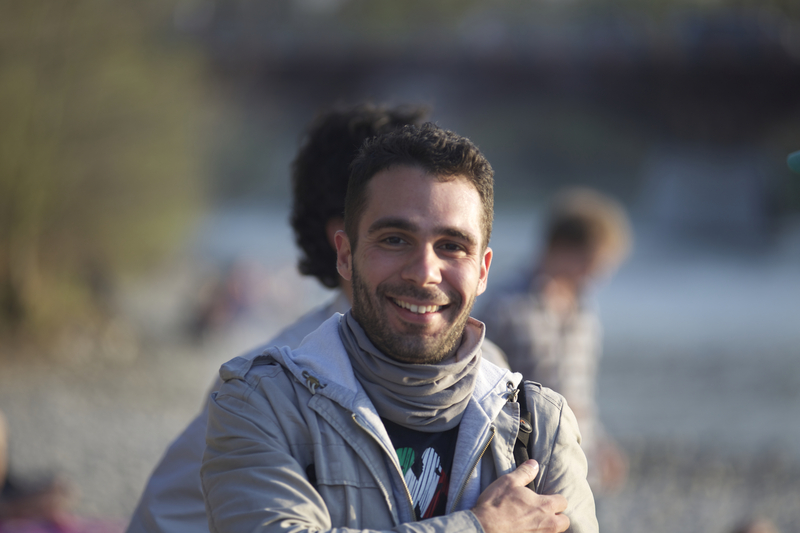 The students are required to pursue their undergraduate studies outside Germany. The first two awards amount to 4500 Euros and the second two awards to 4000 Euros. These awards will provide financial support for the awardees during their research stay at CAMP for a period of up to three months between June 2018 and October 2019. 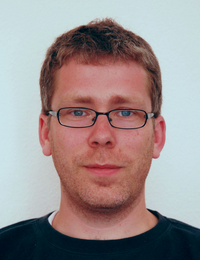 The Medvis / Karl-Heinz-Höhne Award 2018 has been awarded to Markus Rempfler. The Medvis Karl-Heinz Höhne Award has been established in 2004 by the 'Gesellschaft für Informatik' (GI) working group on Visual Computing in Medicine and Biology. 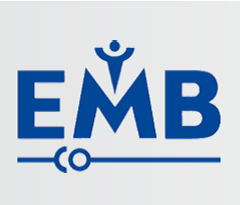 It is awarded bi-annually to a young scientist for outstanding work on image analysis, visualization and interaction in the field of image-based diagnostics and therapy in biology and medicine. Our Deep Learning papers were featured in the %_Q_%Deep Learning and the Future of Biomedical Image Analysis%_Q_% article published in the Biomedical Computation Review (BCR). This talk introduces the concept and applications of consistency conditions in inverse problems with redundant data. We consider inverse problems modelled by some linear operator or matrix A, such as the Radon transform in tomography. The inverse problem consists in solving an equation Ax=y for x given measured data y. In many applications this equation admits a solution only if the data satisfy a set of equations denoted C(y)=0, referred to as the consistency conditions. If the data are noise free and the operator A accurately models the imaging system, the data are by definition consistent because the “exact” object x satisfies Ax=y, and in that case C(y)=0. In practice however the consistency conditions are not satisfied; they can then be used to estimate some vector of parameters p of the imaging system (typically calibration parameters) by solving C(p, y)=0 for p, where C(y, p) denotes the consistency condition corresponding to the parameter p. After a general introduction to the concept, we will review a variety of examples pertaining to 2D and 3D tomography. Applications will be briefly described. Modern X-ray based imaging enables recording of phase-contrast (refraction) and dark-field (scattering) information. Tomographic Reconstruction of the dark-field signal poses an especially challenging problem, as the scattering within an object depends on its orientation. Within this thesis an abstract software framework for Tomographic Reconstruction as well as a novel method for Anisotropic X-ray Dark-field Tomography will be presented. A first biomedical experiment on a sample of a human cerebellum indicates that this method could provide a complementary imaging modality for imaging nerve fibers. In Autosomal Dominant Polycystic Kidney Disease (ADPKD), automated segmentation of kidneys for total kidney volume (TKV) measurement is very challenging due to severe, disease-related alterations in kidney morphology. This PhD? thesis analyzes the applicability and performance of machine learning techniques (Random Forests and Deep Learning) for kidney segmentation in ADPKD. The developed segmentation method based on Deep Learning allows fast and reproducible TKV measurements, demonstrating that machine learning can be successfully used for complex medical image segmentation tasks. Aimed at improving machine learning algorithms by incorporating domain-specific knowledge, we develop a set of mathematical and technical methods that cope with different conditions of data abundance, reliable labels, and class balance. Proposed methods are evaluated for various biomedical applications, in particular, Tomographic Reconstruction and Noise Reduction in Cryo-Electron Tomography, Mitotic figure Detection in Breast Cancer Histology Images, and Depth Perception in Interventional Imaging. Depth cameras are becoming key tools for computer vision tasks ranging from hand, body or object tracking, 3D reconstruction and simultaneous localization and mapping. Almost all these tasks need to solve a tracking problem i.e. each new frame of depth and image data is correlated to the previous, and this temporal information allows for faithful pose and/or geometry reconstruction over time. However, this reliance on temporal information, makes tracking problems hard to solve when using sensors running at 30fps, due to susceptibility to high frame-to-frame scene motions and artifacts such as motion blur. [..] In this talk we are going to demonstrate a 3D capture system for high speed and high quality depth estimation, and show its advantages in a variety of computer vision tasks. Our hardware and software depth pipeline can run at 1.1msec with modern GPUs and readily procurable camera and illumination components. Recently, deep structured networks such as deep convolutional (CNN) and recurrent (RNN) neural networks have enjoyed great success. However, similar to most machine learning techniques, current deep learning approaches rely on conventional statistics and restricted to a specific problem formulation. In particular, they are designed to learn a model for a distribution (or a function) that maps a structured input, typically a vector, matrix, or tensor, to a structured output. Due to this limitation, deep learning has not had any success or significant impact in many other applications. In fact, many problems such as object detection, graph matching, and multi-target tracking, are naturally expressed with sets of elements rather than vectors. As opposed to a vector, the size of a set is not fixed in advance, and it is invariant to the ordering of its elements. Therefore, learning approaches built based on conventional statistics cannot be used directly for these problems. In the talk, I will discuss deep learning approaches that use finite set statistics and point processes instead of conventional statistics, as a step towards the set learning problem. I will also highlight further recent work. Invited Talk by Dr. Del Bue: Tomasi and Kanade revisited: from 3D point reconstruction to object based structure from motion. This talk will present how semantic information as extracted by object and region detectors can be used to perform classical 3D Computer Vision tasks in a robust way. In particular, object positions can be used to simply calibrate cameras and to identify the position and orientation of objects in 3D. Strikingly, this solution has a closed form that can be solved very efficiently, similarly to the standard Tomasi and Kanade factorization problem. Moreover, the information of the position of objects can be used to initialise standard methods for 3D reconstruction using feature point matches. This new approach provides a novel pipeline to efficiently inject semantic information in Structure from Motion problems. Computer Vision with CNNs performs well for people detection. This is not enough. A step forward can be taken to understand the aspect of people detected in low resolution, or corrupted by occlusions in the crowd; to track them in the wild; to detect saliency and pay attention to details only; to forecast motion and human actions. [..] The talk will present projects and results carried out at Imagelab University of Modena and Reggio Emilia on people aspect classification, tracking and saliency analysis based on what people see. Ultrasound imaging is commonplace in clinical routine and has become the standard of care for a plethora of diagnostic scenarios. Due to issues such as limited image quality or obstructed visibility of anatomy, the exclusive use of this modality for interventional guidance purposes has, however, not yet reached a comparable level of maturity. This thesis addresses several challenges associated with ultrasound imaging by proposing advanced techniques for interventional use. Although applied to a broad spectrum of clinical fields and anatomies, their underlying methodology is generic and can be transferred to other medical scenarios. First, a framework for multi-modal prostate biopsy guidance is introduced, allowing urologists to accurately target suspicious lesions by combining trans-rectal ultrasound information with complementary functional tomographic data. The crucial part of this fusion consisting of deformable image registration is solved by two novel algorithms based on automatically segmented prostate surfaces or a preconditioned intensity similarity metric and a statistical deformation model. To overcome the challenges of manual acquisitions, in particular navigation to and maintenance of appropriate location and suitable acoustic window, robotic solutions are studied. Based on multi-modal image registration, a visual servoing control scheme for neurosurgical navigation is introduced. While compensating for target anatomy movements in real-time, it allows for automatic needle guide alignment for accurate manual insertions. The suitability of such systems for reliable robotic acquisitions even in absence of planning data is demonstrated by applying the developed methods, including image quality optimizations using confidence maps, for automated abdominal aortic aneurysm screenings. Through Doppler modes, ultrasound physics uniquely allows fast analysis of blood flow dynamics, albeit limited to 2D projections. This thesis introduces a novel technique to recover 3D velocity information in combination with a temporal flow profile using measurements from multiple directions. Due to the importance of accurate and linearly independent sampling, the advantages of robotic acquisition schemes can be hereby fully exploited. 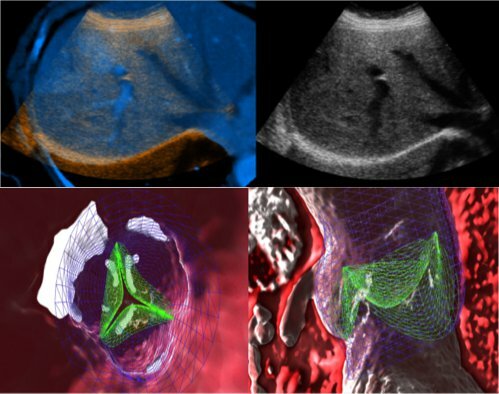 Results of phantom experiments, volunteer studies and clinical patient evaluations, all in close collaboration with medical partners, demonstrate the great potential benefit of advanced ultrasound imaging techniques in interventional settings in terms of both efficacy and efficiency. Once again our students made the difference. Only 12 papers out of over 800 submissions to MICCAI 2017 where nominated for Young Investigator Awards (less than 2%). This list include 3 papers from CAMP. The task of semantic image segmentation, i.e. the simultaneous partitioning of an image into regions and the labeling of their content, is a fundamental objective in computer vision and medical image analysis. The need for segmentation algorithms can be encountered in diverse real-world scenarios. In some cases, the segmentation of a scene must be entirely automated, for example to act as a scene understanding tool to help the decision-making of an autonomous system. In other situations, a segmentation algorithm can assist a human user in annotating an image. In this case, the fully-automated aspect is no longer crucial and can be relaxed in favor of an improved flexibility via interactions with the user. In this thesis, we demonstrate how the statistical learning framework of decision forests can be exploited for these two scenarios and propose three contributions. First, we introduce an efficient and generic scale-adaptive forest training scheme for fully automated image understanding. In the context of large digital slides in histopathology, we propose an interactive and adaptive solution entangling segmentation with image exploration to facilitate the examination of these large images. Finally, we show how the segmentation task can be modeled as a Twenty Questions game towards hands-free human-computer interactions. Overall, we hope to demonstrate the effectiveness of decision forests for automated segmentation in diverse application domains. Moreover, we wish to emphasize the relevance of interactive settings and to introduce practical learning-based solutions in cases where standard interactive techniques are not directly applicable. Structural magnetic resonance imaging data are frequently analyzed to reveal morphological changes of the human brain in dementia. Most contemporary imaging biomarkers are scalar values, such as the volume of a structure, and may miss the localized morphological variation of early presymptomatic disease progression. Neuroanatomical shape descriptors, however, can represent complex geometric information of individual anatomical regions and may demonstrate increased sensitivity in association studies. Yet, they remain largely unexplored. In this talk we will describe sensitive computational methods for the automated quantification of neuroanatomical morphometric estimates and their longitudinal changes. We will, furthermore, show that neuroanatomical shape features, such as lateral shape asymmetry, demonstrate increased sensitivity to detect early disease effects and can improve computer-aided diagnosis of dementia. Instrument detection and pose estimation has attracted great interest in retinal microsurgery. Automatic detection of the instrument parts and estimating the instrument pose promote many applications to guide the surgeon in the operation room. One important application is the automatic positioning of Optical Coherence Tomography (OCT) scans to estimate the distance between the detected instrument tip and the retina to minimize the damage during the surgery. There are many other applications that employ the pose of the instrument such as activity recognition and surgical workflow analysis. This work addresses the problem of detecting the instrument parts (tips and/or the joint point). The first contribution employs instrument’s color and geometric information, while the second exploits deep learning to localize the instrument tip and the shaft’s orientation. In our third contribution, we formulate the problem as a regression task, where a new Hough Forest pipeline is proposed to predict the locations of the instrument parts within the 2D image space. We are happy to announce that Oliver Zettinig received the 3rd Best Student Paper Award at ISBI 2017 for his work Preconditioned Intensity-Based Prostate Registration using Statistical Deformation Models. Congratulations! Ultrasound transit time spectroscopy (UTTS) approximates ultrasound propagation through composite media as an array of parallel sonic rays. Via deconvolution of experimentally derived ultrasound input and output signals the resulting impulse response of the test sample, being dependent upon its composition and structure. Applications of UTTS include estimation of bone volume fraction of composites and improving image axial resolution. This talk will provide an overview of the UTTS research within our Quantitative Ultrasound and Image Characterisation (QUIC) research group at QUT. Clinical assessment routinely uses terms such as development, growth trajectory, aging, degeneration, disease progress, recovery or prediction. This terminology inherently carries the aspect of dynamic processes, suggesting that measurement of dynamic spatiotemporal changes may provide information not available from single snapshots in time. Image processing of temporal series of 3-D data embedding time-varying anatomical objects and functional measures requires a new class of analysis methods and tools that makes use of the inherent correlation and causality of repeated acquisitions. This talk will discuss progress in the development of advanced 4-D image and shape analysis methodologies that carry the notion of linear and nonlinear regression, now applied to complex, high-dimensional data such as images, image-derived shapes and structures, or a combination thereof. Methods include joint segmentation of serial 3D data enforcing temporal consistency, building of 4-D models of tissue diffusivity via longitudinal diffusion imaging, and 4-D shape models. We will demonstrate that statistical concepts of longitudinal data analysis such as linear and nonlinear mixed-effect modeling, commonly applied to univariate or low-dimensional data, can be extended to structures and shapes modeled from longitudinal image data. We will show results from ongoing clinical studies such as analysis of early brain growth in subjects at risk for autism, analysis of neurodegeneration in normal aging and Huntington's disease, and quantitative assessment of recovery in severe TBI. This talk summarises the work carried out by Upul Senanayake during his PhD? candidature at the University of New South Wales Sydney, Australia. Diagnosis of Mild Cognitive Impairment (MCI), which is a prodromal condition to Dementia, is considered to be an active research area as it holds a high prognosticative value in predicting an individual's progression to Dementia. In this talk, multiple modalities of data is explored and leveraged to improve such predictive efforts including patient data, neuropsychological test scores and multiple imaging modalities such as MRI and PET. A range of machine learning and image processing techniques are used for this purpose. Problems of interest include extracting meaningful data from multiple modalities of data, fusion between multiple modalities of data, leveraging the inherent characteristics of data to improve the performance and visualising the predictive efforts in a meaningful manner for the medical professionals. Professor Navab gave a TEDx talk on Medical Augmented Reality. Our paper A Basic Tool for Background and Shading Correction of Optical Microscopy Images has been recently accepted by Nature Communications. The aim of the research work was to investigate the development of a simulated operating room which could be an option for conducting assessment and training of surgical skills within a multidisciplinary controlled environment. The findings will enable other national/international research and simulation centers to develop more sophisticated training environments and the hope exists that this work will trigger a new generation of simulators which will eventually improve medical education of multidisciplinary teams and hence increase patient safety and raise the quality of patient care. This thesis deals with the control of image quality for a robot-held ultrasound probe. The ultrasound signal quality within the image is represented by a confidence map, which is used to design a servo control law for optimizing the placement of the ultrasound probe. A control fusion is also proposed to optimize the acoustic window for a specific anatomical target tracked in the ultrasound images. These methods are illustrated via experiments on phantom and on a human volunteer. Machine vision is a technologically and economically important field of computer vision. It eases automatization of inspection and manipulation tasks, which in turn enables cost savings and quality improvement in industrial processes. Usually, 2D or intensity images are used for such applications. However, thanks to several technological advances, nowadays there are sensors available that allow depth or 3D measurements with high resolution, frequency and accuracy at a reasonable cost. Such 3D data enables new applications that are difficult or impossible to implement with 2D images only. Quantification of skin properties can provide a better understanding of its behaviour in many applications, such as the wound healing process, the effects of ageing, the process of wrinkle formation, and skin and breast surgeries. Skin is a complex tissue that is anisotropic, heterogeneous, nonlinear, and viscoelastic. Several methods have been developed to characterise the complex mechanical behaviour of skin in-vivo or in-vitro, such as during biaxial, compression, suction, or indentation tests on tissues. Three awards at MICCAI 2016! Here's the newest member of the CAMP family! We are happy to announce that our CAMP family has grown for one more person. 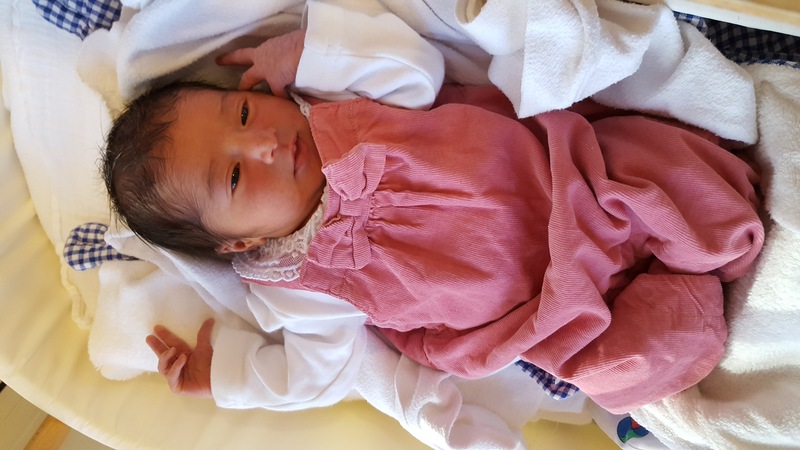 Mohamed Alsheakhali and his wife just became parents of a cute little sprout named Nada on 2nd of November. Imaging and visualization of anatomy and physiology are the very foundation of Computer Assisted Surgery, and crucially contribute to the success of interventions. The goal of the research presented in this thesis is the introduction of novel image registration techniques as means of transferring pre-operative imaging and planning to the surgical scenario, and intra-operative image acquisition to obtain images just in time and within the surgical site. Best Poster Award at the 6D Pose Recovery workshop! We are happy to mention that one of our works at ECCV 2016 has been given a 'Best Poster Award' as a submission to the 6D Pose recovery workshop. 13 papers of our chair will be presented at the 19th International Conference on Medical Image Computing and Computer Assisted Interventions (MICCAI 2016) in Athens (Greece), October 17-21, 2016. With an acceptance rate of approx. 30%; MICCAI is one of the most competitive international meetings in the field. It is based on full paper submissions and double blind review process. Medical information is employed in different scenarios, such as education, training, diagnosis, and surgery. Perception and interaction of this information is fundamental, and augmenting the perception through personalized interaction with multi-model data is user specific. The good of this thesis if to investigate personalized perception through development of novel interaction method with the different medical information suitable for students, patients, and doctors. This work focuses on the development of visual computing techniques for advanced medical ultrasound visualization. At first, techniques for improved 2D B-mode ultrasound visualization are presented where the observer is provided with real-time feedback on the uncertainty present in the image. The second part of this thesis then introduces an orientation-driven ultrasound compounding approach to create high-quality 3D ultrasound volumes. Finally, a novel predicate-based classification technique allows for more meaningful visualization of such data. 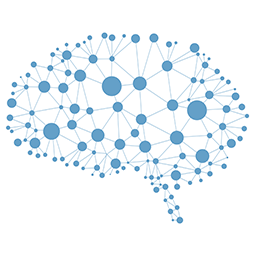 From April 5th until April the 7th, a Deep Learning-workshop will take place at CAMP. We will introduce the participants in some related topics, also they will have the possibility to check out some practical examples. We are happy to announce that our CAMP family has grown for one more person. 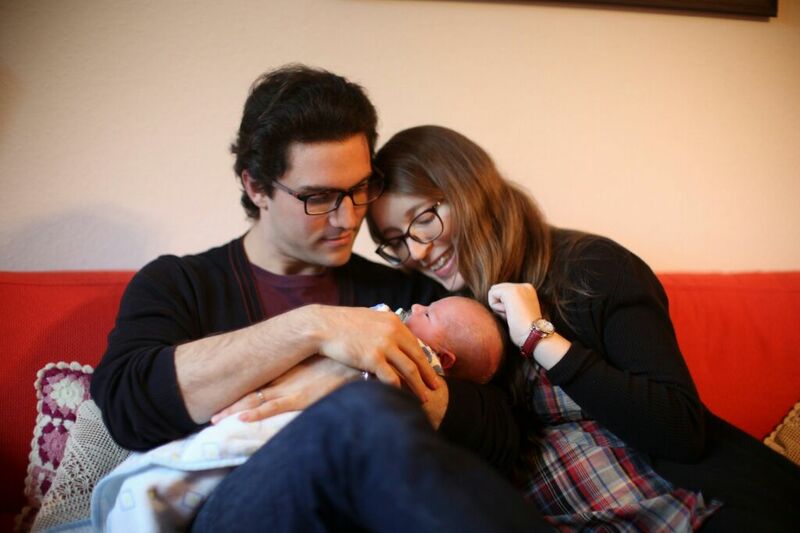 Silvan Kraft and hhis wife Sylvia just became parents of a cute little sprout named Jolan. As part of the anniversary celebrations of the LMU Klinikum Innenstadt we would like to invite you to visit us at the NARVIS Day on July 27th starting at 6pm. A lecture, live demos, and an industry exhibition are open to the public. 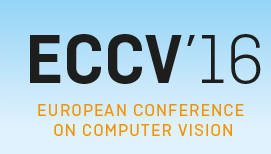 We are happy to announce that two of our works have been accepted to the European Conference on Computer Vision ECCV 2016. Our AggNet paper has received more than 1100 views in 4 months and is one of the top downloads at IEEEXplore (worldwide) for May 2016 ! Two members of our chair, Dr. Benjamin Frisch and Ralf Stauder, won an Outstanding Reviewer Award at IPCAI 2016. What's new in Virtual Reality @ Google? Two years ago Google released cardboard a simple headset that uses smartphones to let user around the world experience Virtual Reality (VR). In this talk I will discuss some of the new technical capability that we presented at Google I/O last month. I will describe some of the new feature of Android N that you can try today with the developer preview and dive into the use of the daydream controller. Finally I will present some of the use case that we have been exploring for VR at Google. Check out our novel living review concept at http://livingreview.in.tum.de. The workshop is part of the ongoing collaboration on Medical Augmented Reality between the Nara Institute of Science and Technology (NAIST) and the Technical University of Munich (TUM). The presenters Prof. Kato, Prof. Sato, Prof. Otake, Prof. Sandor, and their team from NAIST have a strong background in Imaging-Based Computational Biomedicine, Human-Computer Interaction, and Augmented Reality. Furthermore, the NARVIS team of the Chair of Computer Aided Medical Procedures from TUM will present their current research projects. The workshop provides a platform for exchanging information and as a groundwork for future collaborations. 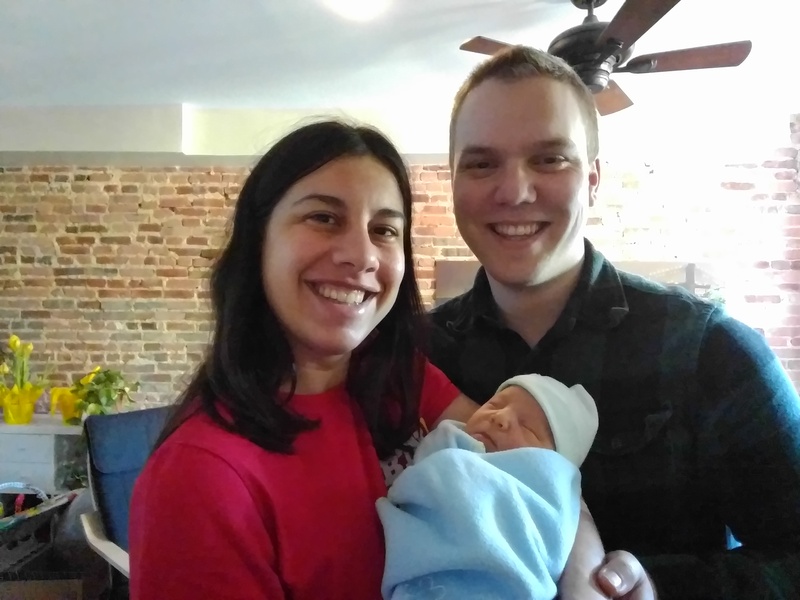 We are happy to announce that our CAMP family has grown for one more person. Asli Okur Kuru and her husband Ismail just became parents of a cute little sprout named Hasan Efe. We are happy to announce that our CAMP family has grown for one more person. 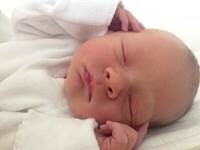 Bernhard Fuerst and his lovely wife Niki just became parents of a cute little sprout named David. 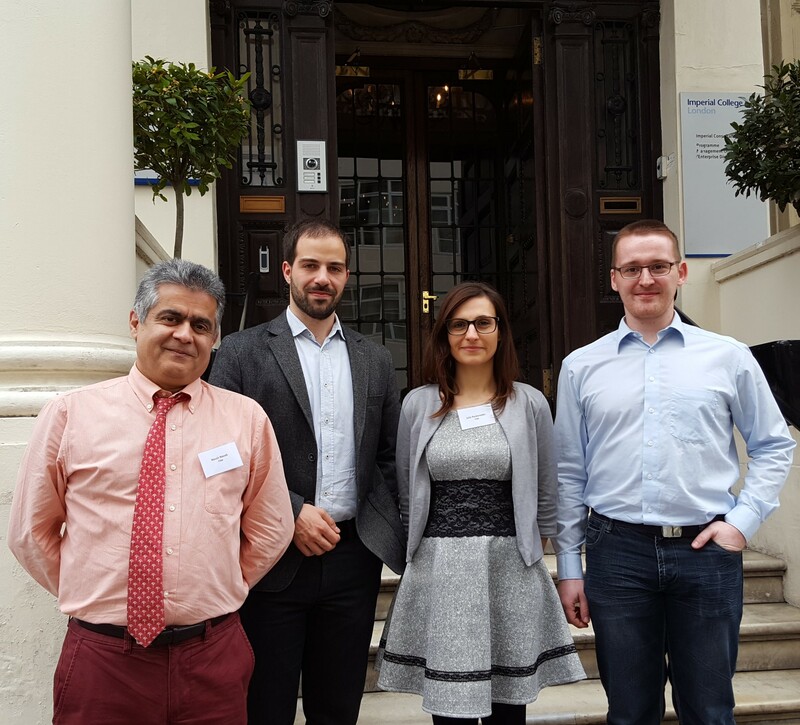 We are happy to announce that on Monday the CAMP TUM team kicked-off the new European project Eden2020 at Imperial College London together with consortium partners across Europe. The goal of EDEN2020 is to develop an ehanced delivery ecosystem for Neurosurgery; more information to the project can be found on our project page. We are being mentioned in a newspaper article on Medical Big Data! There will be an invited talk by Christian Hansen on Thursay, Feb 18, 2016, at 11am. Our joint effort on the first SPECT imaging using a miniaturized drop-in gamma detector and the da Vinci surgical system has not just been accepted for publication in the IEEE Transactions on Medical Imaging. , but is one of the currently featured articles. 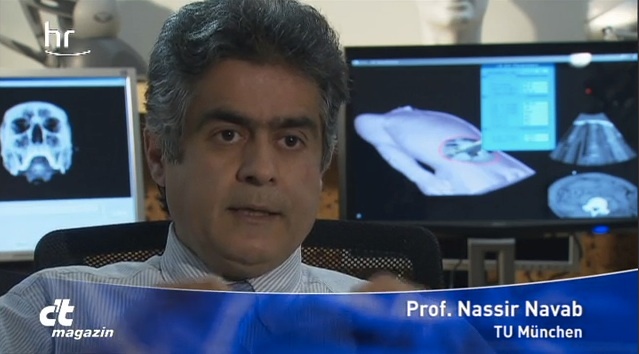 BBC Horizons program features a report on Medical Augmented Reality, showcases CAMP’s technology and interviews with Prof. Nassir Navab. 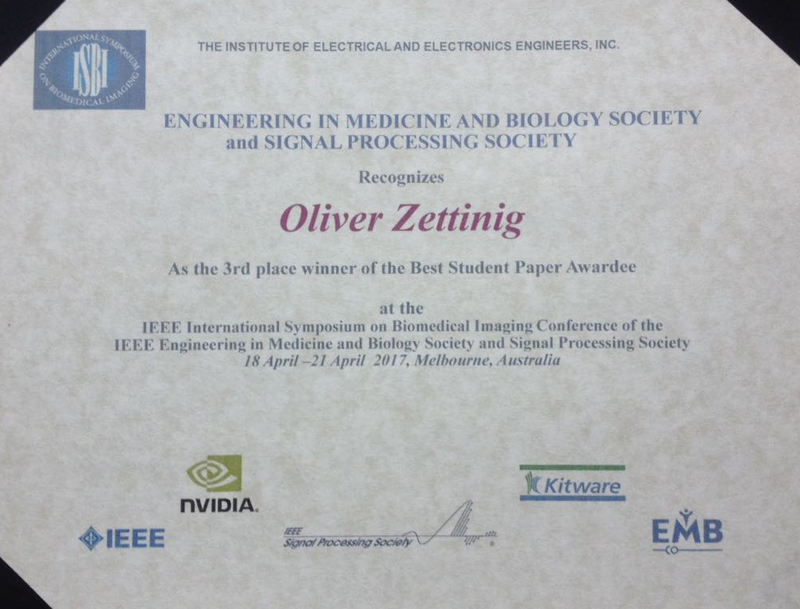 The Medical Image Analysis Best Paper Award 2015 was awarded to Markus Rempfler, Bjoern Menze and co-authors from ETH Zurich, MPI Informatik, Northwestern University, and the Argonne National Lab for their paper entitled: Reconstructing cerebrovascular networks under local physiological constraints by integer programming. The “Young Scientist Impact Award” 2015 was awarded to Bjoern Menze for his article entitled: “A generative model for brain tumor segmentation in multi-modal images”, co-authored by Koen Van Leemput, Danial Lashkari, Marc-André Weber, Nicholas Ayache, and Polina Golland. It was presented at MICCAI 2010 in Beijing, China. We are very proud to announce that two of our current PhD candidates were acknowledged for their outstanding work presented at the international conference MICCAI 2015. The Digital Heritage 2015 best paper award goes to Alexandru Duliu et al. for their work on 'Illumination Compensation for High-Resolution Multispectral Image Mosaicing of Heritage Paintings. 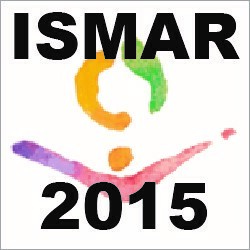 Prof. Nassir Navab has been awarded with the 10 Year Lasting Impact Award at ISMAR. He was honored for overall contributions to augmented reality, with a particular focus on medical augmented reality on October 2, 2015 within the IEEE ISMAR in Japan. 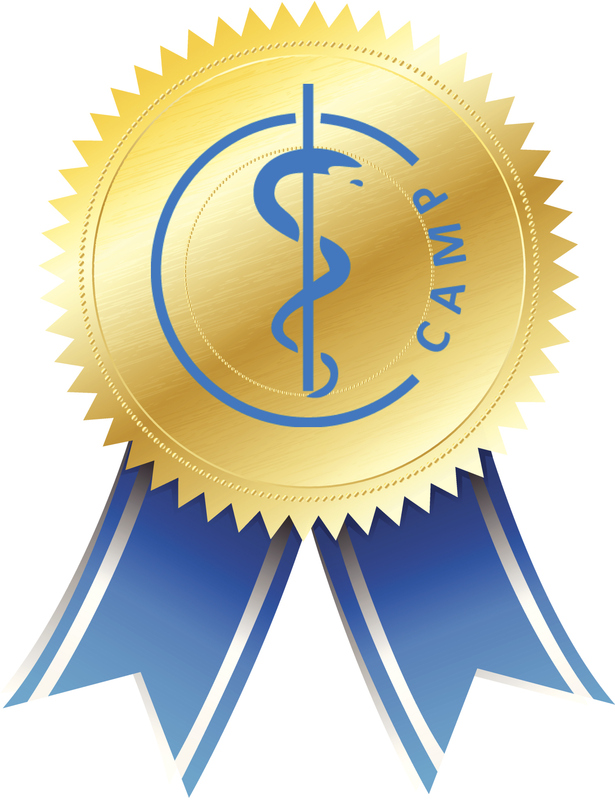 Members of the Chair of Computer Aided Medical Procedures (CAMP) participated in the Prostate Cancer DREAM challenge and were able to win one of three subchallenges. For years, simplifying assumptions have been necessary in X-ray Computed Tomography to make the reconstruction of images feasible. Only recently, computer hardware has become powerful enough to tackle problems classically beyond reach. This thesis discusses three such problems: Reconstruction from incoherent measurements of a beating heart, automatic path planning enabling optimal patient-specific sensor trajectories, and X-ray scattering tomography yielding information about sub-voxel structures. Image registration is described as the process of bringing images into an alignment. One application of image registration in medical imaging is the construction of a larger field of view of a scene from its partial views. Intensity-based methods try to find an alignment in terms of intensity matches in the overlap. However, in cases when the size of the overlap is small or the information therein is unreliable, this often leads to a structurally inconsistent, suboptimal alignment. Hence, this thesis investigates this problem and introduces a series of structural consistency measures as local and global regularization for intensity-based registration of partial images. Estimating human body poses from images is a demanding task that has attracted great interest from the computer vision community. Determining automatically the body pose promotes many applications such as human tracking, motion capture, activity recognition, surveillance and surgical workflow analysis. This work addresses the problem of human pose estimation from different perspectives. Deep learning has been extensively used to efficiently solve and provide state of art solutions to problems like handwritten character recognition, speech recognition, lexical ordered speech synthesis, object and product recognition, image retrieval, content filtering, product visibility tracking, computational medical imaging. This workshop will focus on the buzz around this topic and how firm does the buzz hold on to the claims it boasts of? Also we would host a hands-on tutorial with implementing a deep network using auto encoders for solving the hand-written digit recognition problem. The requirements of fault diagnosis and isolation (FDI) for fully or semi-autonomous systems that must operate for long durations in adverse conditions outstrips the capacity of centralized monolithic approaches. Multi-agent FDI (MAFDI) is a means of addressing the need by placing the workload across many components. This work proposes a fault-free model of a system’s configuration. A controller combines the configuration estimate with its local knowledge of previous commands and control objectives to create a fault assessment. The fault-free model is implemented using strictly local belief propagation messages over a factor graph. The model is tested on a simulation of a testbed for a naval vessel’s chilled water fluid system. The second meeting of the 'Computer Vision and Medical Image Analysis Meetup' group of Munich will take place on the 24th July 2015 in room EG.0120 of the main building of the technical university of Munich in Arcistr. 21. This meeting is endorsed by CAMP and its purpose is to bring together enthusiasts, professionals, researchers and students to discuss about recent advancements in the field of computer vision and medical image analysis. Sonography is the modality of choice for initial examinations in vascular applications, but suffers from high operator-dependency and variations in acquisition parameters in 3D. With the goal of an improved quality and reliability, this thesis introduces a set of mathematical and technical methods, incorporating domain-specific knowledge in the whole ultrasound processing chain. This includes a novel solution for the acquisition of 3D+t US data as well as both physically and biologically inspired models for an improved processing of ultrasound data. We are pleased to announce that the Technical University Munich Chapter hosted by our CAMP chair has been selected as the 2015 Best New Student Chapter. Our activities have been recognized internationally for providing valuable, local interactions among members of the Biomedical community and enabling learning by distinguish guest lectures, field trips and panel discussions. More than 40 years ago, the U.S. government declared a “war on cancer” and committed to investing in laboratory and clinical research in order to understand the causes of cancer and thereby aid its diagnosis, treatment, and cure. Despite enormous advances and important improvements in the diagnosis and treatment of many cancers, the “war” has in significant ways progressed less than originally hoped. The complexity of the disease is clearly evident by the dynamic and evolving course the disease takes during its progression and response treatment. 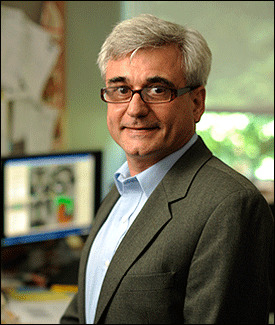 15 March 2015, Washington, D.C.
We would like to congratulate our long term research partner, Dr. Ali Kamen, a Principal Key Expert in Imaging and Computer Vision at Siemens Corporate Research, who has been elected Fellow of the American Institute for Medical and Biological Engineering. In this talk, we propose retrieving the most dissimilar images of the object depicted in the query and develop two novel methods for a particular instances of dissimilarity search: the zoom-in and zoom-in for finding the maximum and minimum spatial resolution depicting the query. 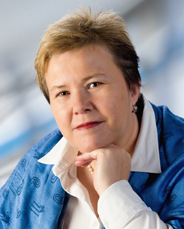 iri Matas is a full professor at the Center for Machine Perception, Czech Technical University in Prague. 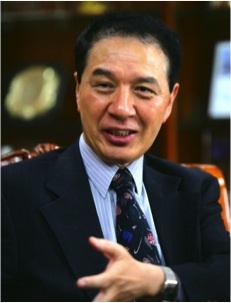 He has published more than 200 papers in refereed journals and conferences. Google Scholar reports about 20 000 citations to his work and and an h-index above 50. The first part of this thesis focuses on learning-based template tracking approaches, with the goal to follow the position of an object or region within an image sequence. The second part of the thesis focuses on fast methods for 3D data processing. This includes an efficient normal estimation method as well as a learning-based approach for interest point detection in depth maps. 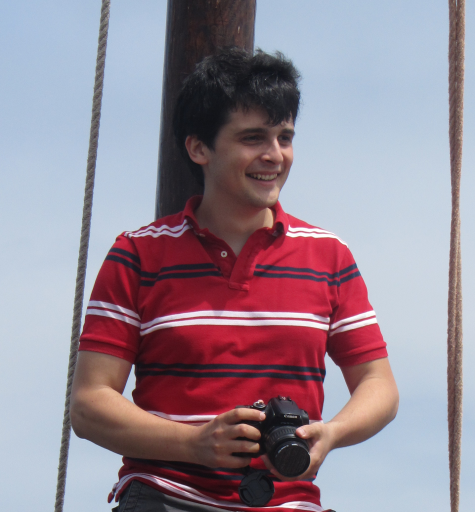 Stefan's thesis resulted in a series of most prestigious conference and journal publications including PAMI, IJCV, ECCV, CVPR, ACCV, IROS, BMVC and ICCV. Michael Friebes lecture Translational Technology Entrepreneurship was ratet the best elective course at the faculty of Informatics and Mathematics at the TUM in the Summer Semester 2014. The seminar will focus on: (i) Catheter roadmap display under natural respiration by use of diaphragm region, and (ii) Registration between pathological image and MR image for comparing different modality images of brain tumor. Translational research from lab bench to the marketplace where products and services are provided and consumed is far more difficult and time-consuming than many people estimate or are willing to tolerate. In spite of these challenges, successfully commercializing our research results is the most rewarding experience as an engineer and researcher. In this presentation, Prof. Kim will share his experiences and opinions on the obstacles and formula of success (or failure) in academic research and technology commercialization. Ex-CAMPer Dr. Pierre Georgel will be talking about his current field of work at Google and the change from academia to industry. He received his PhD? from TUM in 2011 and spend some time at UNC with Jan-Michael Frahm before leaving academia in 2012. Dr. Peters' laboratory, Robarts Research Institute, is concerned with the development and validation of tools that allow surgeons to make efficient use of images, produced by sophisticated 3-D imaging systems, during surgical procedures. The objective of minimally-invasive neurosurgery is to resect or lesion the smallest volume of brain tissue, causing the least trauma to the patient while achieving the desired therapeutic result. 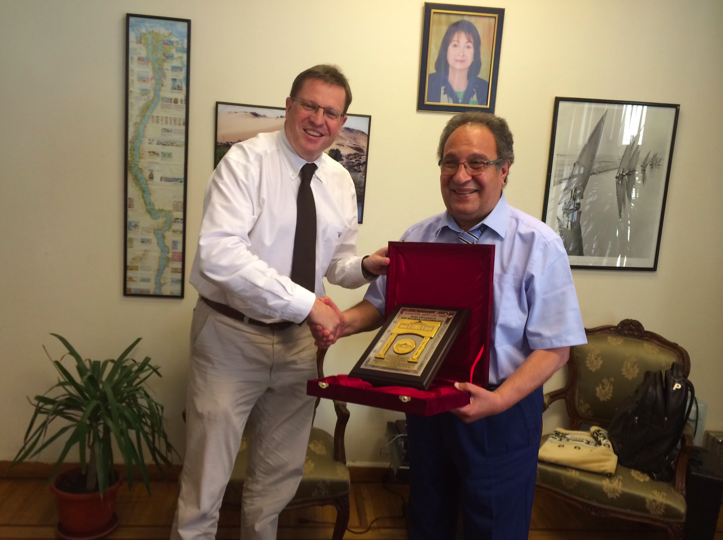 Misr University of Science and Technology is honoured to announce that Michael Friebe, PhD (Rudolf-Diesel-Fellow at the TU München, Germany) has been nominated Honorary Professor of the Faculty of Engineering. 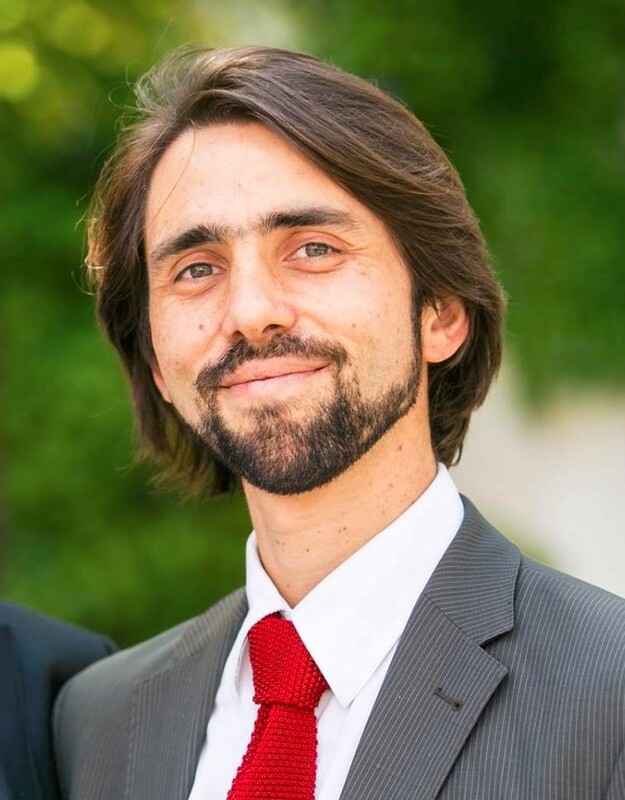 It is our great pleasure to announce that Dr. Gustavo Carneiro (Associate Professor at University of Adelaide, Australia) has been selected to receive the highly competitive Humboldt Research Fellowship for Experienced Researchers and will join our group for 6 months starting in August 2014. 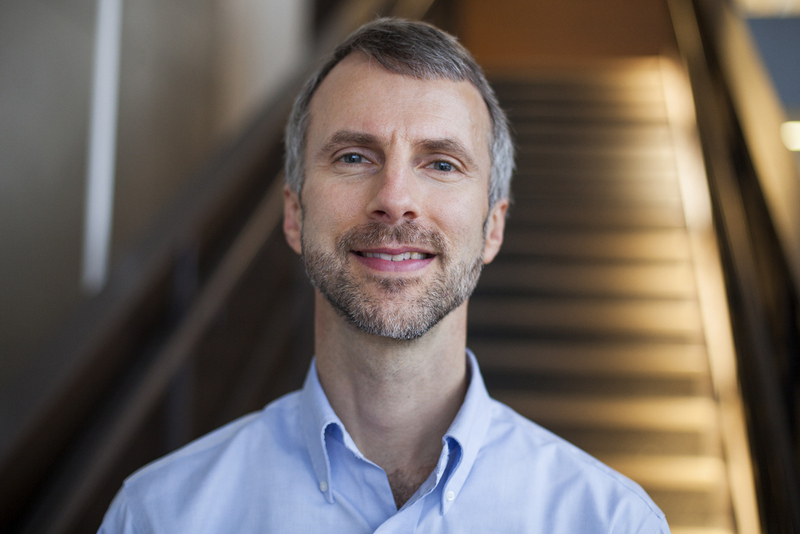 We are very delighted to announce that Prof. Greg Hager Chair of Computer Science at Johns Hopkins University has been selected to receive the prestigious IAS Hans Fischer Senior Fellowship. This Fellowship is named after TUM Professor Hans Fischer (1881-1945), who was awarded the Nobel Prize in Chemistry in 1930 for his pioneering work on hemoglobin and related structures. Outstanding international scientists, who intend to explore innovative, high-risk topics in their scientific research areas together with a TUM Research Group for a duration of three years, are eligible for a TUM-IAS Hans Fischer Senior Fellowship. 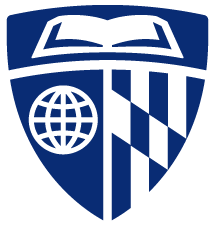 This affiliation strengthens our strong links with JHU towards a joint center in computational medicine. 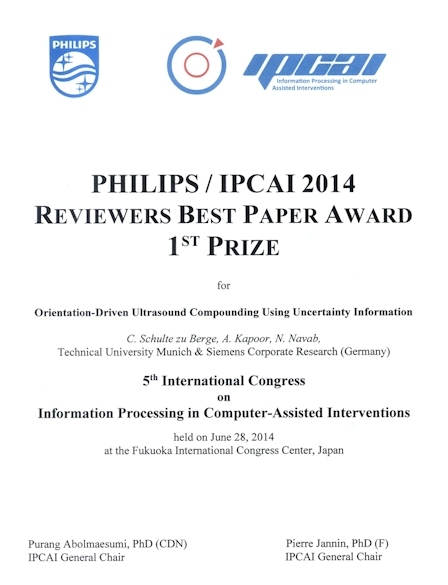 We got the Reviewers Best Paper Award at the 5th International Conference on Information Processing in Computer-Assisted Interventions (IPCAI 2014). IPCAI 2014 was held on June 28 in Fukuoka, Japan (co-located with CARS). Based on a highly selective double anonymous review process, IPCAI is aiming at organizing an event in which the best conference articles in computer assisted interventions are reviewed, selected, presented, and actively discussed. On a daily basis, surgeons refer to information presented in medical images before entering the OR. Once surgery starts, medical images have a more passive role in the action plan. The roles of medical images are often diagnostic (used as a map) rather than therapeutic (used as an assistant). In this presentation, I will discuss a few attempts we developed in the U of Alberta to enhance the role of medical images inside the operating room, exploring the impact of image-integrated concept on pre-surgery planning, surgical performance, and on surgeons’ mental readiness. PolyAxNail develops an innovative, polyaxial marrow nail for the treatment of bone fractures. These bone implants allow the surgeon maximum flexibility during the surgery, with following maximum stability for the patient. Last week a team from Arte visited the CAMP chair for a report about our current projects and future research activities. Prof. Nassir Navab gave an interview which will be aired in a July episode of X:enius. Together with colleagues from other groups, we are organizing the Joint MICCAI-Workshops on Computing and Visualization for Intravascular Imaging and Computer Assisted Stenting (CVII-STENT) at MICCAI 2014. MR:comp provides magnetic resonance (MRI) safety and compatibility testing and is participating in and leading research projects for MRI safety and compatibility of implants and devices and thus accompanying important development of numerical and experimental testing methods. 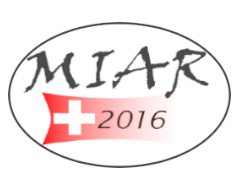 From May 19th through May 22nd 2014, the Workshop on Advanced Imaging and Visualization (ImVis) will take place in Innsbruck, Austria. Together with representatives of the Robotics and Telematics group at University of Würzburg headed by TUM-IAS Fellow Prof. Dr. Klaus Schilling, we will host a joint session on Robotics and Telematics in Medical Imaging. This event is meant to analyze potential high-level collaboration projects of the two excellent groups. A Special Issue on Computer Assisted Stenting will appear within Elsevier Journal on Computerized Medical Imgaing and Graphics. Dirk Sunderbrink joined Siemens in 1995 and served for more than 10 years in sales and business management for radiological information systems. Currently he holds the position of Global Marketing Manager for cardiology in angiography business unit. Arno Bücker is currently the chair of the clinic for diagnostic and interventional radiology at the University Clinic of the University of Saarland in Homburg, as well as professor for radiology. 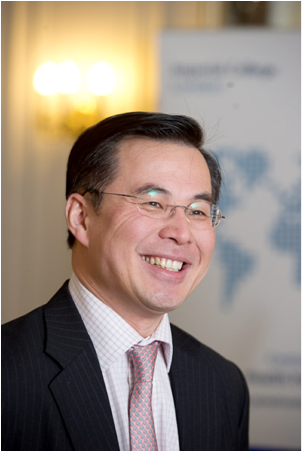 His research interest include new diagnostic imaging guided therapeutic applications, in particular interventional MRI. Recent applications of optoacoustics to biomedical imaging encouraged its translation into clinical practice. The talk concentrates on our efforts in translating the MSOT imaging technology into a high performance functional and molecular imaging modality routinely used in both pre-clinical research and clinical practice. In this presentation, Ali Kamen is going to give a general description of personalized medicine and companion diagnostics, and show some applications of the concept based on medical imaging data. Medical imaging projects at University of Alberta, focusing on recent works on discrete deformable registration based on the random walker (RW) algorithm. 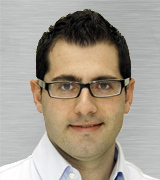 Dr. Sergi Vidal-Sicart is an authority in radio-guided surgery on an international level. He was one of the introducers of the portable gamma cameras in the OR and is an excellent source of knowledge in the real life use of gamma probes, portable gamma cameras and freehand SPECT in the OR. We are very proud to announce that two of our alumni, one current PhD candidate, and one BMC Master student were awarded prestigious international scientific awards at MICCAI 2013. We are very proud to announce that Matthias Wieczorek won the VDI Award 2013 of the (Verein Deutscher Ingenieure) for his master's thesis Curvelet sparse regularization for differential phase-contrast X-ray imaging. Dr. Oliver Kutter, one of our outstanding alumni and now Senior Domain Engineer at Stryker, gives an overview of current activties at the Freiburg subsidiary of the Stryker Group. We demonstrated our Magic Mirror Miraccle System at DLDWomen13 Night successfully on 15 July. A large number of visitors played with our program. Here are a few of many cool pictures of this event, which was sponsored by Siemens Corporate. This dissertation introduces a novel method for confidence estimation from ultrasound images, denoted as ultrasound confidence map. The estimation problem is formulated as a random walk on a graph, taking into account ultrasound specific constrains. The method was successfully introduced into different ultrasound image processing applications and improved their results. Caitlin Schneider, promising early-stage researcher UBC (Dr. Tim Salcudean), is presenting her high-level research results. In the video section of heise.de a short documentary about activities at our chair was published, click here for more information and the video itself. 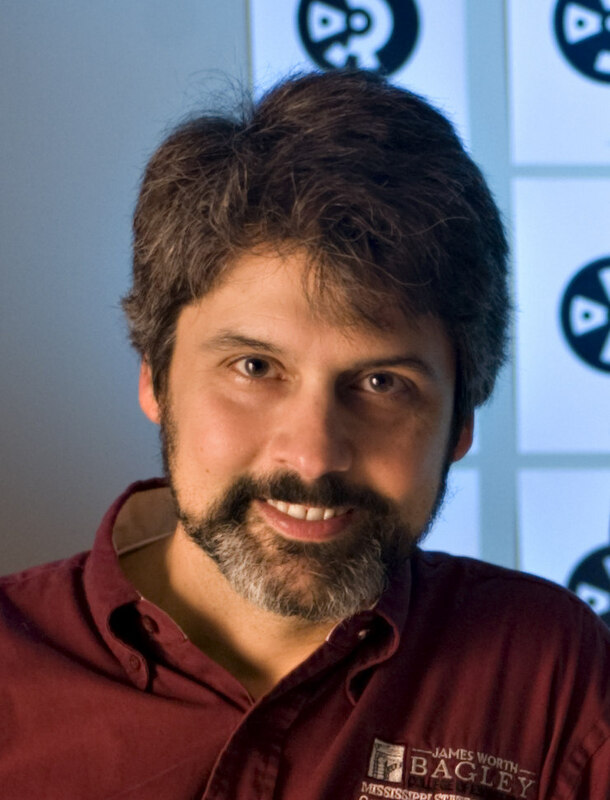 Public Lecture by TUM-IAS Visiting Fellow Prof. Edward J. Swan II: How Do We Measure Depth Perception in Near-Field Augmented Reality? The perception of depth is an important aspect of augmented reality (AR): many AR applications have an important depth component, and AR displays do not display the depth of virtual objects with the same fidelity as real objects. Read more. Breast cancer is the most frequent cancer amongst women. Since chances for full recovery are very good as long as it is detected at a sufficiently early stage, many countries have installed screening programs. Read more. For more information go to the TUM-IAS website. Our paper "First Deployments of Augmented Reality in Operating Rooms" has been selected as a notable paper in computing in 2012. The research activities of the group of IAS - Fellow Michael Friebe focus on the combination of minimal-invasive therapy techniques with diagnostic imaging and navigation techniques (e.g. application of intra-operative radiation therapy, MRI guided high focussed ultrasound, intra-operative SPECT with MRI guidance, ...). This talk reports a brief overview of the Nereus vehicle design, and reviews the initial results of the dives conducted on these expeditions, including two dives to more than 10,900m depth. To optimally support medical education, computer systems need to make use of latest visualization techniques, allow for intuitive interaction and use appropriate domain models such that computer systems can interpret the interaction with the user and provide optimal feedback. To provide surgeons with optimal guidance during interventions, it is crucial that the molecular imaging data generated in the diagnostic departments finds its way to the operating room. This talk will be an introductory talk about Samsung group and Samsung Advanced Institute of Technology(SAIT) and their various research domains and research interests in medical field. 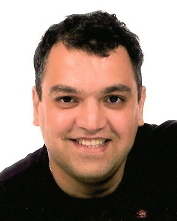 Prof. Nassir Navab joins the editorial board of International Journal of Computer Vision IJCV. 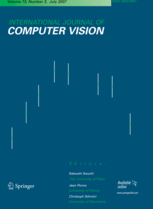 IJCV is one of the most prestigious and high ranking international journals in computer science. Prof. Dawant will give the latest status on their Cranial-Vault system, which allows improved multi-modal image-guided pre-operative planning, intra-operative navigation and post-operative atlas building of Deep-Brain-Stimulation neurosurgeries. In the past decades, transcranial 2D ultrasound examination has established itself for diagnosis of neurological movement disorders such as Parkinson’s Disease. In this work, we introduce a complete system for a more objective, computer-assisted examination of the midbrain using 3D ultrasound. 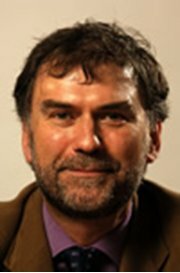 Prof. Meinzer: Was kann Medical Imaging zur Diagnostik und Intervention beitragen? Together with colleagues from other groups, we are organizing MICCAI-STENT, the 2nd MICCAI-Workshop on Computer Assisted Stenting at MICCAI 2013. MRI & Molecular Imaging: what's good for clinical translation? Seamlessly embedding virtual geometries in a live camera stream is only possible when accurate estimates of the camera poses and a map of the environment are available. To this end, two real-time methods have been developed within the scope of this thesis. The first method extends template tracking to 2.5D and targets convex objects. The second method reconstructs and tracks objects of arbitrary shape based on RGB-D images. Furthermore, a novel methodology for benchmarking visual tracking algorithms is presented. The camera motion is precisely recovered using an external measurement device. The first dataset specifically designed for planar template-based methods was published in 2009. This dataset is still used daily at metaio, it has also been used at several research institutes. The European Union's PicoSEC and EndoTOFPET-US research consortia organize a workshop on Intra-operative Imaging and Navigation Solutions on Wednesday, January 16, 2013 between 09:00 to 17:30 at Klinikum Rechts der Isar, Munich ( Pavillon ). This workshop will mainly cover topics pertaining to medical imaging, image analysis, image reconstruction, 3D ultrasound, tracking & navigation, medical machine learning and medical robotics as detailed below. If you are interested in attending this workshop then please register yourself by filling the required information in the e-form. In this thesis various methods are investigated on how to take advantage of medical ultrasound radio frequency (RF) data. RF data is the signal from which in the processing pipeline of ultrasound machines the commonly known B-mode image is generated. The comparably high resolution and the raw signal characteristics make RF data attractive for statistical image processing. In this respect, focus is devoted to the applications of correct spatial alignment of US data referred to as registration. At first methods are presented within the 2D domain, addressing issues such as textural and probabilistic description. Later this is expanded to 3D US freehand data and its reconstruction with a particular view on transcranial scans that are recorded for early diagnosis of Parkinson's disease. The detection of salient events in video sequences displaying low contrast and high dynamic conditions is becoming of increased interest for the community of computer vision. This thesis introduces novel methods for the analysis of such scenes, and in particular for automatic detection of thrombus formation in low contrast in vivo microscopic image sequences. This application is of crucial interest for identifying genetic variations which lead to an increased risk of developing cardiovascular diseases (CADs). 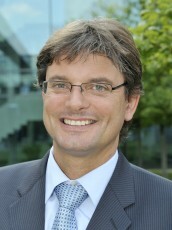 Dr. Arthur Kaindl is Chief Executive Officer of the Siemens AG, Healthcare Sector, Business Unit Image and Knowledge Management. Within the context of the lecture Medical Technology Entrepreneurship held by Rudolf Diesel Industry Fellow and affiliated Professor Michael Friebe, Dr. Kaindl will give a talk about innovation and software at Siemens Healthcare. Modern surgery rooms are complex environments equipped with a great deal of high-technology equipment. Context-aware systems in such an environment could relieve surgical staff from performing simple but time-consuming tasks, and assist them with performing tedious tasks. The potential applications of such a system range from procedure documentation and safety monitoring to task automation and coordinated robotic assistance. In this talk, I will first present an overview of recent work aimed at developing a context-aware human-machine collaborative system for tele-surgery, prototyped on the da Vinci robot at the Johns Hopkins University. I introduce OKAO vision which is facial image sensing technology. Our OKAO vision has various functions for human understanding. It is categorized to 1) detect human position by face / human detection, 2)recognize human attribute by face recognition, gender/ age estimation and eye open/close estimation etc, 3)recognize human behavior by object tracking, action recognition, and 4)estimate human intention. We have provided these functions to major DSC/DVC companies. I will explain and demonstrate these functions and show application examples. 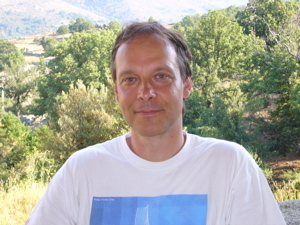 As part of the tum.reconstruction series of invited talks, Prof. Michael Unser from EPFL, Lausanne, will present a talk titled: A spline framework for tomographic image reconstruction. Advanced computerized systems play a vital role in modern Operating Rooms (OR); however they can also be challenging for the OR crew while operating them. As a solution, in this work a specific domain model has been proposed. This model has been exploited in development of two supportive frameworks. The first framework is OR-Use, which is developed for conducting multicenter usability evaluations for intra-operative devices and facilitates the acquisition, management and analysis of usability data. The second framework is Signal.NET, a flexible framework that enables to define customizable, context-aware and human-centered interfaces for intra-operative solutions. These frameworks can be a basis for many other multi-disciplinary collaborations and studies in the future. Ivan Sutherland, a pioneer in computer graphics now working at Portland State University, has won this year’s Kyoto Prize in Advanced Technology, an annual award from a Japanese foundation that recognizes significant technical, scientific and artistic contributions to the 'betterment of mankind.' Professor Navab gave an invited lecture within the workshop organized to honor Prof. Sutherland on November 12 in Kyoto. Our collaborator Leo Grady received the Edison Patent Award for medical imaging for his Random Walker patent (US Patent 7,460,709). A video with an interview about the patent can be found in this news post. The video with an interview about the patent can be found below. The video includes comments from two other colleagues, Marie-Pierre Jolly and Gareth Funka-Lea, who worked with Leo at Siemens Corporate Research. We congratulate Leo for this great achievement. Well deserved! For their paper Efficient Learning of Linear Predictors using Dimensionality Reduction Stefan Holzer, Slobodan Ilic, David Tan and Nassir Navab received the 'Best Application Paper Honorable Mention' Award at the Asian Conference on Computer Vision (ACCV), Daejeon, South Korea,. The Open Day at the Research Campus Garching will take place Saturday, 27.10.2012, this year from 11-18Uhr and the Chair for Computer Aided Medical Procedures will present two current research projects. A selected group of outstanding researchers from the industry with a strong connection to TUM Research Groups will become Rudolf Diesel Industry Fellows of the TUM-IAS. This year, Dr. Michael Friebe is among them and we are happy to welcome him as Affiliated Professor at the Chair for Computer Aided Medical Procedures. We have been conducting the e-Heritage project, which converts assets that form our cultural heritage into digital forms, by using computer vision and computer graphics technologies. We hope to utilize such forms 1) for preservation in digital form of our irreplaceable treasures for future generations, 2) for planning and physical restoration, using digital forms as basic models from which we can manipulate data, 3) for cyber archaeology, i.e., investigation of digitized data through computer analysis, and 4) for education and promotion through multimedia contents based on the digital data. This talk briefly overviews our e-Heritage projects underway in Italy, Cambodia, and Japan. We will explain what hardware and software issues have arisen, how to overcome them by designing new sensors using recent computer vision technologies, as well as how to process these data using computer graphics technologies. We will also explain how to use such data for archeological analysis, and review new findings. Finally, we will discuss a new way to display such digital data by using the mixed reality systems, i.e. head-mount displays on site, connected from cloud computers. 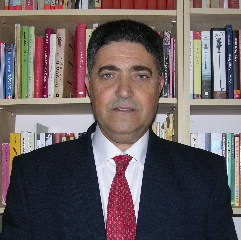 Within the award ceremony at MICCAI 2012, Prof. Nassir Navab joined the ranks of few notable medical imaging scientists worldwide as an elected Fellow of the MICCAI Society. The aim of this thesis is to propose novel image-guided solutions enabling optimal C-arm X-ray guidance for orthopedic and trauma surgery. 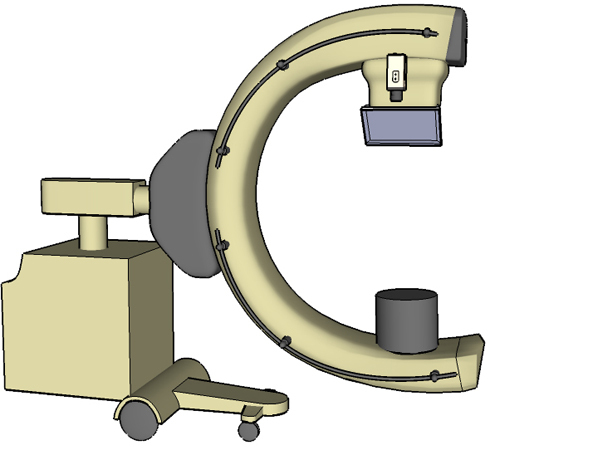 The first major contribution to this thesis is investigating the surgical workflow in several orthopedic surgeries which would allow for the effective use of the Camera Augmented Mobile C-arm (CamC). The second contribution is the development and evaluation of parallax-free panoramic X-ray imaging. Finally, we propose a solution to optimally acquire X-ray images by modeling the C-arm and table setup as an integrated 6 degrees of freedom (DOF) kinematics chain. The proposed novel image-guided solutions are validated through pre-clinical experiments, including animal cadaver and dry bone phantoms, as well as clinical trials involving 43 patients. 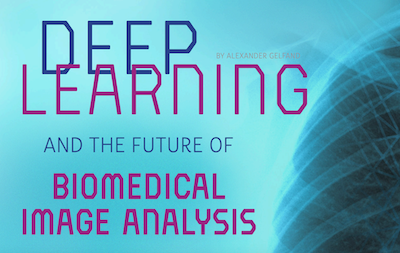 Machine learning incarnates a key component for integrating the knowldege and experience of physicians into medical imaging applications. Random forests are a popular learning algorithm consisting in an ensemble of independent decision trees. They are very intuitive models that offer a flexible probabilistic framework for solving different learning tasks. In this thesis, we formalize random forests models as ensemble partitioning approaches and propose novel related techniques for classification, regression and clustering. We introduce new task-specific forest models and demonstrate their great potential in different medical applications such as organ localization, segmentation and image categorization. 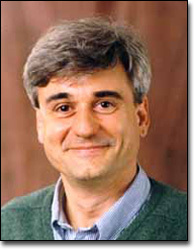 Prof. Navab will give a keynote at the WBIR 2012, the fifth Workshop on Biomedical Image Registration. 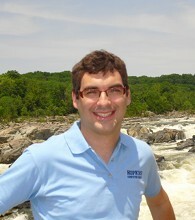 He will also give an invited talk at the Vanderbilt University on Fiday, July 6. Professor Hideo, from the Department of Information and Computer Science,Keio University, Japan, will present his research work on 3D Visual Media. Invited talk by Lorenz König from NYU Medical Center. Recent introduction of probe-based confocal laser endomicroscopy (pCLE) enabled real-time and in-vivo visualisation of biological tissue on a microscopic level. Due to their non-invasive nature, optical biopsies involve the new challenge of re-targeting previous biopsy sites during surveillance examinations. In this thesis, a novel scene recognition method is presented to support the re-targeting of optical biopsy sites in surveillance GI-endoscopies. Drawing on the mathematical framework of manifold learning, a new representation for endoscopic videos is introduced. Experimental evaluation on real clinical data demonstrates the feasibility of the proposed methods as a promising step for assisting the endoscopic expert in re-targeting optical biopsy sites. In this thesis, we investigate machine learning methods for human motion analysis. We introduce algorithms for human pose estimation and activity recognition that do not build upon conventional cameras and that can cope with noisy and incomplete input data. We propose methods that capture human movements using body-worn inertial sensors or using a depth camera. In a training phase, the measurements from these modalities are complemented with precise and complete movement information recorded with a camera-based motion capture system. A novel approach for learning models of human motion is introduced based on non-linear dimensionality reduction and regression that enables human pose estimation and simultaneous activity recognition, given only the inertial sensor or depth data. Our paper Human skeleton tracking from depth data using geodesic distances and optical flow (L. Schwarz, A. Mkhitaryan, D. Mateus, N. Navab) is listed as third most downloaded paper of the Image and Vision Computing Journal in the period April to June 2012. Digital Pathology is a relatively new field in medicine and still developing stage for clinical use. However, conventional pathology is rapidly shifting towards digital integration. After the Whole Slide Imaging Robot became available to produce virtual slides automatically, rapidly and a high resolution, many issues and limitations we had with telepathology and pathology imaging seemed to be solved. The combination of the WSI and Image Analysis can be very helpful for pathologists if it works right. We have developing the algorithm and protocol to improve the image quality and reliability to make images useful in practice. To promote imaging, we have developed several applications and tools including 1) an automated, image analysis algorithm that is trainable for various purposes and 2) histology 3D imaging, 3) a ultra fast WSI viewing system. Advanced imaging research such as multispectral imaging for digital staining is moving to the validation study. Research and efforts to validate WSI systems for diagnostic settings are ongoing. Skin cancer is one of the most frequently encountered types of cancer in the Western world. According to the Skin Cancer foundation Statistics, one in every five Americans develops skin cancer during his/her lifetime. Today, the incurability of advanced cutaneous melanoma raises the importance of its early detection. Since the differentiation of early melanoma from other pigmented skin lesions is not a trivial task, even for experienced dermatologists, computer aided diagnosis could become an important tool for reducing the mortality rate of this highly malignant cancer type. In this thesis, a computer aided diagnosis system based on machine learning is proposed in order to support the clinical use of optical spectroscopy and dermatoscopy imaging techniques for skin lesions quantification and classification. As part of the tum.reconstruction series of invited talks, Dr. Thomas Wendler will present recent developments on real-time freehand SPECT reconstructions. The accurate and robust detection and tracking of objects in different kinds of imaging data is a fundamental task in computer vision, which can be achieved by so-called active contours. The contribution of this dissertation is the development of a novel class of polar active contours, i.e. a sub-class of active contours which can only describe star-shaped objects. These novel active contours enjoy several properties, such as an increased robustness to noise for instance, which are particularly desirable for medical applications, e.g. the segmentation of abdominal aortic aneurysms from computed tomography angiography data or the tracking of the left ventricular cavity acquired by magnetic resonance imaging. Computed tomography is rather advanced and experienced an immense innovation boost in the last decade. Nowadays reconstruction algorithms for rigid objects exhibit excellent image quality. Contrast and spatial resolution are sufficient for many diagnostic and interventional procedures. One out of many, but very demanding open problems in interventional imaging is still the three-dimensional reconstruction of perfusion processes using C-arm devices. The impact of such a system would be outstanding: perfusion measurements could be done during interventions using the existing imaging equipment. In this talk I will present initial algorithmic and clinical results for C-arm perfusion imaging in the interventional suite. This thesis describes a novel method for acquiring depth images using multi-view Time of Flight (ToF) cameras, which uses a constructive interference between the emitted signals to enhance the depth accuracy. This work proposes to combine the measurements of the multi-view cameras at the acquisition level, in opposite to approaches that filter, calibrate or do 3D reconstructions posterior to the image acquisition. This work presents an example using a pair of ToF cameras in stereo-set-up defining a three-stages procedure, in which the infrared lighting of the scene is actively modified. This thesis also presents two applications of Monocular Simultaneous Localization and Mapping (MonoSLAM). The first application is using MonoSLAM in endoscopic images and the second one in a RGB-D sensor. Inspired by the ability of humans to interpret and understand 3D scenes nearly effortlessly, the problem of 3D scene understanding has long been advocated as the 'holy grail' of computer vision. In the early days this problem was addressed in a bottom-up fashion without enabling satisfactory or reliable results for scenes of realistic complexity. In recent years there has been considerable progress on many sub-problems of the overall 3D scene understanding problem. As the performance for these sub-tasks starts to achieve remarkable performance levels we believe that the problem to automatically infer and understand 3D scenes from should be addressed again. Real-Time detection is a key component in various areas of computer vision, e.g. in industrial inspection, augmented reality and robotics. For many applications it has to work robustly and in real-time in order to be fully operational. While real-time detection of well textured objects has already reached a high level of maturity, its application on low-textured or texture-less objects is still an open issue. Unfortunately, those kinds of objects play an important role in man-made environments which makes it necessary to deal with them in an efficient manner. In this thesis, we therefore present four novel methods for the efficient and reliable detection of low-textured and texture-less objects which are superior to current state-of-the-art approaches w.r.t. robustness and speed. Radiologists and pathologists use geometrical information to make diagnostic and prognostic decisions about the anatomy they observe. As segmentation algorithms improve and datasets become larger, it becomes possible to learn image-based biomarkers with a precise and complete set of measurements. Traditional methods of quantifying shape emphasize classical measures of geometry, such as volume, surface area and curvature which may be evaluated with increasingly mature image segmentation methods. Additional information may be obtained by modeling biological structures as a network of pixels, which allows us to employ an arsenal of powerful network characterization tools to quantify structural and topological properties of biological structures. Finally, population studies to discriminate different subgroups are enabled by our ability to link different locations and attributes across individuals. In this talk I will present how we have been able to apply graph theory to generate robust and effective image segmentation methods, to produce correspondence between different individuals and how we can learn to discriminate population subtypes by going beyond geometrical features with advanced network characterization. 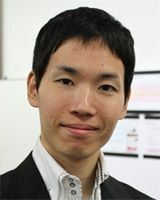 Dr. Maki Sugimoto, Assistant Professor at Keio University, will present his work on Merging Real and Virtual Experiences. Merging real and virtual is an important topic when we think about human computer interactions with Virtual Reality and Augmented Reality techniques. In this talk, we introduce several examples of interactive systems by special projection techniques which integrate real and virtual experiences. The first example is a gaming environment named Augmented Coliseum in which users can play real toys with virtual gaming functions. The second example is Animated Paper: a motion prototyping platform. In this system we integrate a paper based motion designing platform with a laser projection technique. The third example is BYU-BYU-View: a wind communication interface through a projection screen. You can communicate with virtual environments and remote environments by blowing targets on the screen. 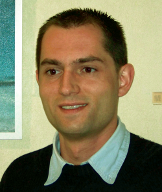 Dr. François de Sorbier, research associate at Keio University, will present his work on Augmented Reality. Recently depth cameras have become very popular mainly due to the success of the Microsoft Kinect. This device can capture the depth of a given indoor environment at real time frame rate even if the resolution or the quality is not perfect. Depth map gives important clues when trying to understand the geometry of a scene. It logically found many useful applications in the field of augmented reality. In this talk, we present some researches taking advantage of the depth camera in order to perform real-time augmented reality. 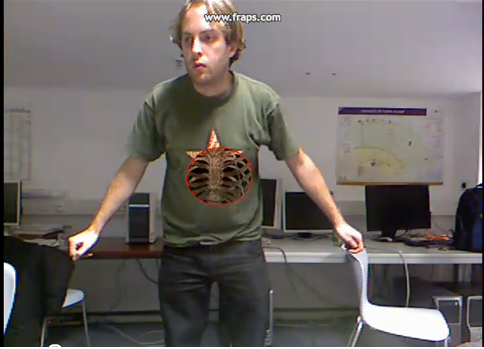 The first research is proposing real-time interactions between the real world and several virtual objects. The second one aims at mapping a texture on a deformed surface like a tee-shirt. Finally we present a research that focuses on using augmented reality for learning how to play violin. Together with colleagues from other groups, we are organizing MICCAI-STENT, the 1st MICCAI-Workshop on Computer Assisted Stenting at MICCAI 2012. 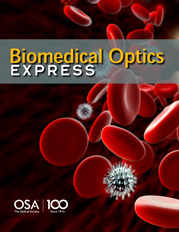 BMC Master Student’s Thesis: finalist for the best student paper award at SPIE Medical 2012! We are proud of our master student, Andrei Chekkoury, who receives the best student finalist award at the international SPIE Medical Conference in San Diego in USA. His work has been selected as one of the 8 finalists between hundreds of international submissions from the best institutions around the globe. Congratulations to Andre, your supervisors at Siemens Corporate Research and Technical University of Munich are proud of this success! 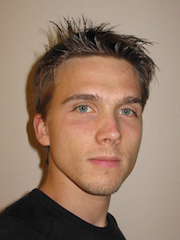 Rostislav Khlebnikov, PhD student at Graz University of Technology, will present his work on scientific and medical visualization. Dynamic cardiac metrics, including strains and displacements, can provide a quantitative approach to evaluate cardiac function. However, in current clinical diagnosis, strain measures in 2D are used despite the fact that cardiac motions are complex changes in 4D. Recent advances in 4D ultrasound enable the capability to capture such complex motion in real time. In our previous work, a 4D optical flow based motion tracking algorithm was developed to extract full 4D dynamic cardiac metrics from such 4D ultrasound data. In order to quantitatively evaluate this method, coronary artery occlusion experiments at various locations were performed on five canine hearts with 4D ultrasound and sonomicrometry data acquired during the occlusion. Optical flow displacement was then mapped onto a finite element field fitted model. Corresponding 4D ultrasound data from these experiments were then analyzed. Estimated principal strains were directly compared to those recorded by sonomicrometry showing strong agreement. This was the first validation study of optical flow based strain estimation for 4D cardiac ultrasound including a direct comparison with sonomicrometry on in vivo data. Electron microscopes (EM) can now provide the nanometer resolution that is needed to image synapses, and therefore connections, while Light Microscopes (LM) see at the micrometer resolution required to model the 3D structure of the dendritic network. Since both the arborescence and the connections are integral parts of the brain's wiring diagram, combining these two modalities is critically important. In this talk, I will therefore present our approach to building the dendritic arborescence and to tracking migrating neurons from LM images, as well as to segmenting intra-neuronal structures from EM images. I will also argue that the techniques that are in wide usage in the Computer Vision and Machine Learning community are just as applicable in this context. Given three or four synchronized videos taken at eye level and from different angles, we show that we can effectively detect and track people, even when the only available data comes from the binary output of a simple blob detector and the number of present individuals is a priori unknown. We start from occupancy probability estimates in a top view and rely on a generative model to yield probability images to be compared with the actual input images. We then refine the estimates so that the probability images match the binary input images as well as possible. Finally, having performed this computation independently at each time step, we compute trajectories over tive by solving a convex constrained flow problem, which allows us accurately follow individuals across thousands of frames. Our algorithm yields metrically accurate trajectories for each one of them, in spite of very significant occlusions. In short, we combine a mathematically well-founded generative model that works in each frame individually with a simple approach to global optimization. This yields excellent performance using very simple models that could be further improved. Dr. Bharat Rao, Senior Director and Head of the Knowledge Solutions (KS) group Health Analytics & Business Intelligence business unit in Siemens Healthcare, will give an invited talk on mining medical images to automatically detect potentially abnormal structures, automated decision-support & inference from EMR’s and personalized medicine for therapy selection. 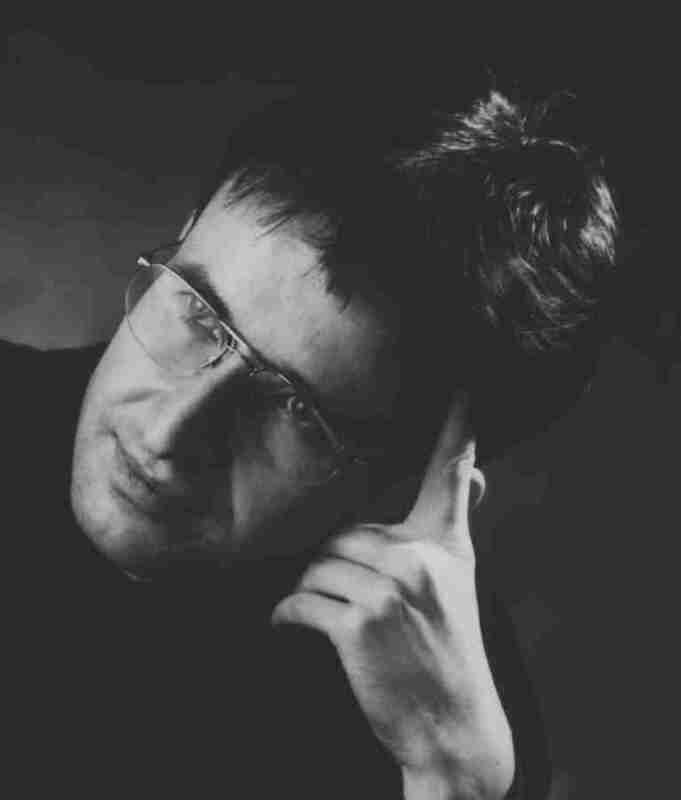 In an invited talk at the CAMP lecture, Prof. Franjo Pernuš, PhD, University of Ljubljana, will present an overview of existing methods, three novel methods for registering 3D CT or MR images to 2D X-ray images, and quantitative registration results. As part of his PhD defense, Darko Zikic will give a talk on Tuesday, December 20, 2011 at 17:00, in Room 02.09.023 (FMI-Building, Garching, Boltzmannstr. 3). We are honored to have Prof. Larry Davis visiting the computer science department and giving a Fachkolloquium on “Context in image (and video) understanding”. Navid Samavati will give an invited talk on “Matching Histology and MRI for Prostate: A 3D Biomechanical Model Based Deformable Registration Approach”. Dr. Dong Sun Shin, PostDoc at Ajou University School of Medicine, will give an invited talk on his current research work using the Visible Korean Human. Age-related macular degeneration (AMD) is one of the leading causes of low vision worldwide without a medical solution. Nevertheless, enhancement of people’s vision by means of mediated reality is conceivable. This thesis presents a head-mounted magnification system to enhance visual perception acquired with peripheral vision. A hybrid magnification technique is adjusted and implemented on a head-mounted display. Furthermore; a system for modeling and correcting distorted vision is proposed. The system obtains a correction model by means of a deformable grid. To evaluate the system; a method for simulating distorted vision is applied. By superimposing the model on OCT macular images; it is suitable to identify macular features; which could help on the development of an automatic correction method. In this talk we describe the development of a prototype for Backover Prevention on an embedded processor. The approach is based on developing (1) memory-agnostic compute functions and (2) optimal data transfers, independent of each other. Thus the data transfer design is orthogonal to the design of vision functions. This feature of our approach to embedded vision significantly simplifies the often very hard process of implementing complex vision algorithms on embedded processors. 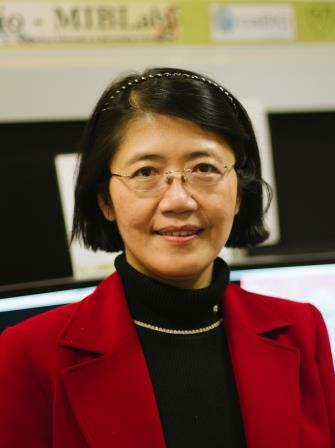 Dr. Tingying Peng, PostDoc at Institute of Biomedical Engineering (IBME) at University of Oxford, will give an invited talk on her current research work. 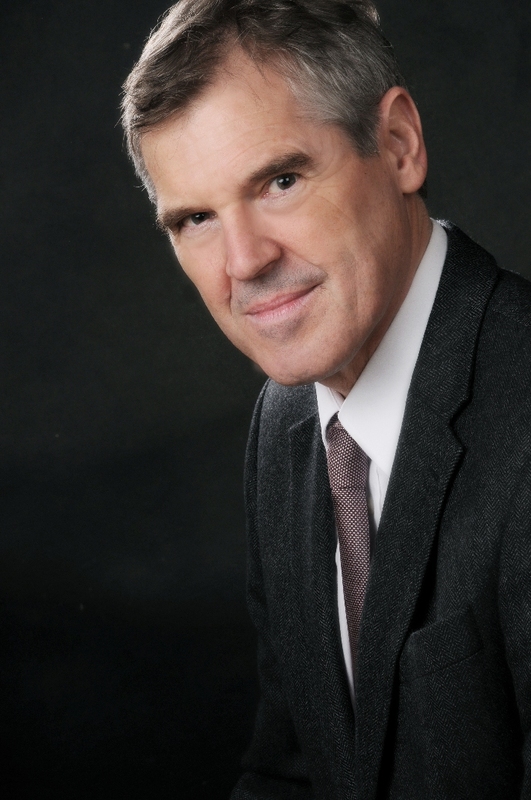 Prof. William (Sandy) Wells, from Harvard Medical School, will describe recent work in the area of simultaneous MRI and EEG of inter-ictal discharges associated with Epilepsy. 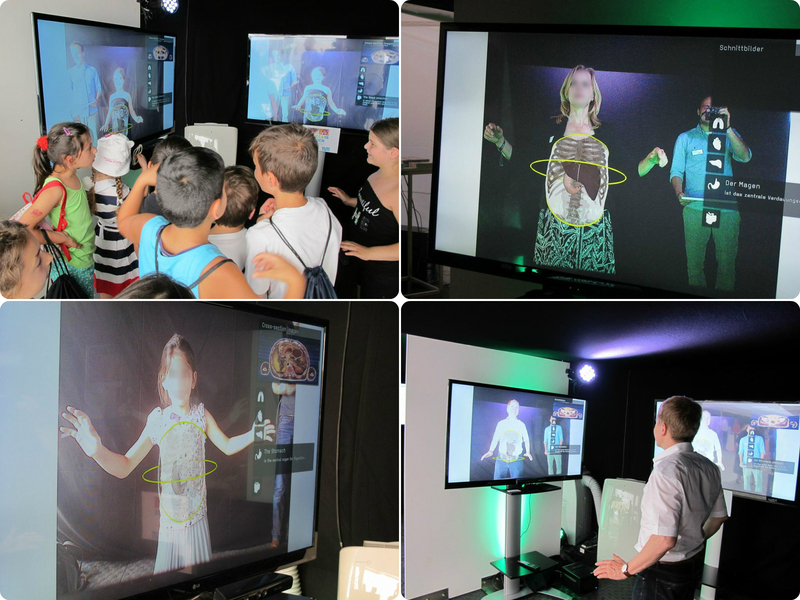 On the German news television (n-tv) a report on the use of Kinect for research was broadcasted. As one example they showed our Magic Mirror project. Dr. Gabrielle Tuijthof, Assistant Professor at the Department of Biomechanical Engineering, TU Delft, will visit the CAMP chair on August 30. 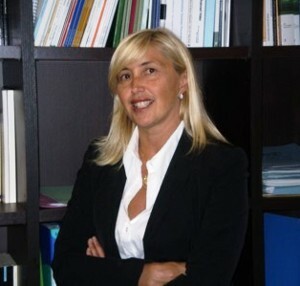 She will talk about technical improvement of arthroscopic and orthopaedic surgical techniques and diagnosis. 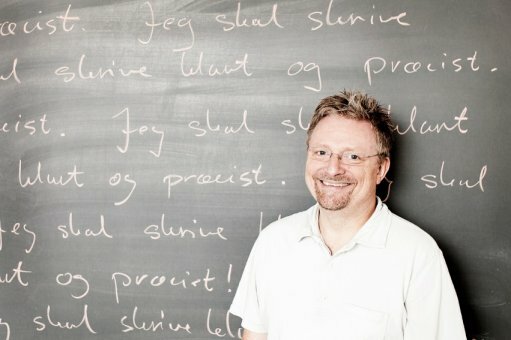 Prof. Dr. Sven Dickinson, from the Department of Computer Science, University of Toronto, will visit the CAMP chair on August 26th. 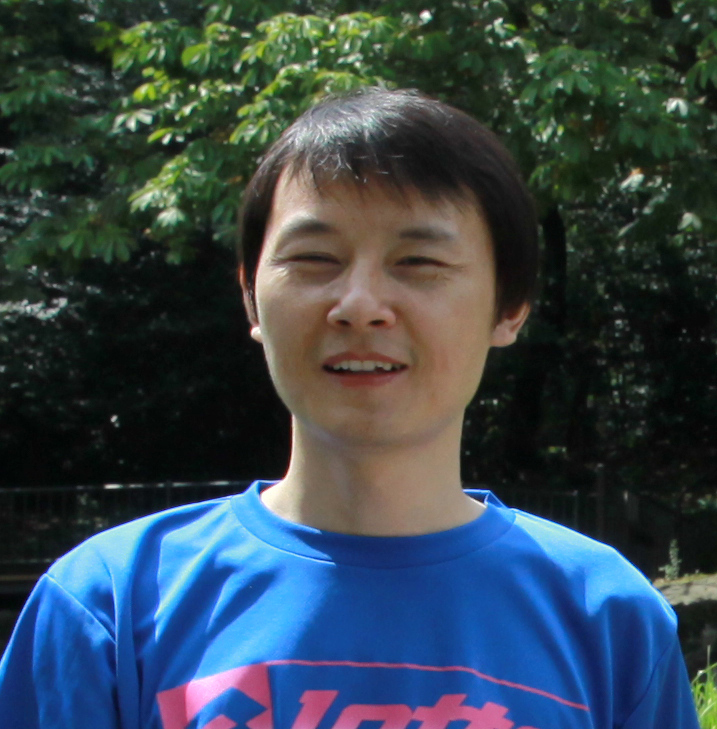 He will talk about the Role of Intermediate Shape Priors in Perceptual Grouping and Image Abstraction . How Do We Measure Depth Perception in Near-Field Augmented Reality? 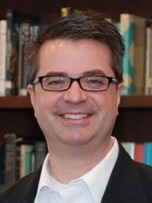 Prof. J. Edward Swan II, from the Department of Computer Science and Engineering, Mississippi State University, will visit the CAMP chair on August 25. 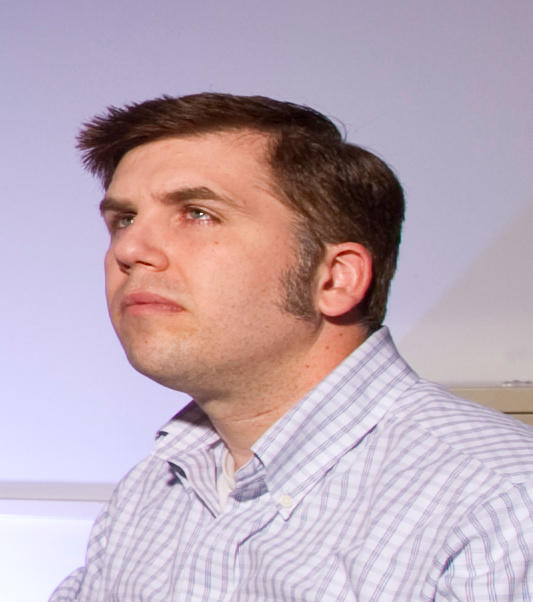 He will give an overview on his recent work in depth perception and augmented reality. 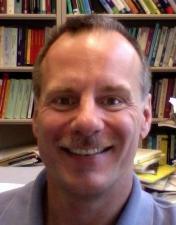 Prof. Dr. Tim Salcudean, from the Department of Electrical and Computer Engineering, The University of British Columbia, will visit the CAMP chair on July 1st. 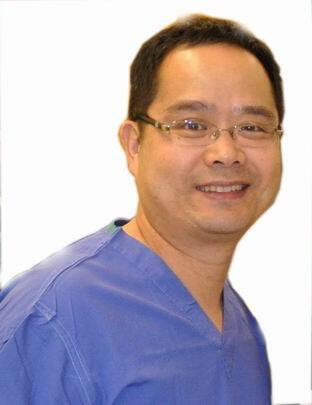 He will give an overview on his recent work in Ultrasound Elastography and present applications to prostate and breast imaging. 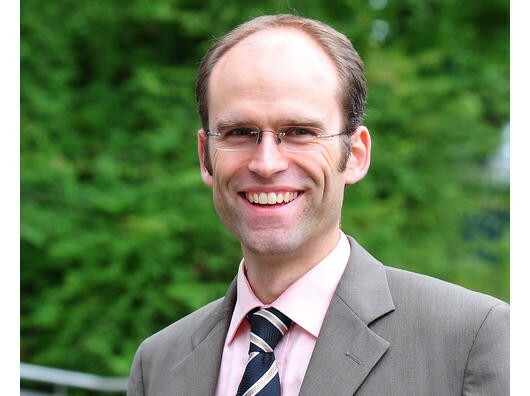 Peter Mountney obtained his Ph.D. in Medical Imaging from Imperial College London in 2010 before joining Siemens Corporate Research. 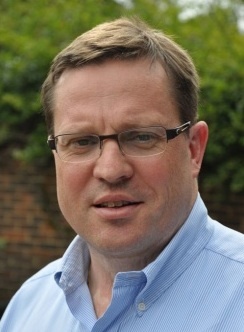 In his talk; he will discuss the challenges of computer vision in Minimally Invasive Surgery and the roles that feature tracking and Simultaneous Localisation and Mapping (SLAM) can play in facilitating new surgical procedures such as motion compensation, Image Guided Surgery, Dynamic View Expansion and Optical Biopsy Mapping. As part of his PhD defense Mr. Dipl.-Inf. 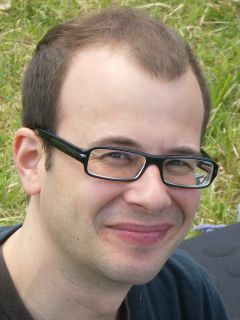 Ben Glocker will give a talk on June 9 2011 at 11.00 a.m. in Room 01.09.014 of FMI-Building, Garching, Boltzmannstr. 3. As part of his PhD defense Dipl.-Inf., Dipl.-Math. Tobias Lasser will give a talk on Thursday, June 9th, 2011 at 15:30, Room 00.12.019 (Fakultätsraum Informatik), FMI-Building, Garching, Boltzmannstr. 3. This talk will summarize 9 years of research towards AR solutions that run on mobile phones, examining computer vision, computer graphics and user interface approaches that have turned out to work well on smartphones, and will also take a look ahead at likely future trends. As part of his PhD defense Dipl.-Inf. Univ. 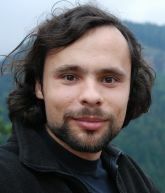 Alexander Ladikos will give a talk on May 5, 2011 at 10.30 a.m. in Room 00.12.019 of FMI-Building, Garching, Boltzmannstr. 3. Invited talk: Toward integrated and personalized management of cerebral aneurysms. After two years of research in Electrical Impedance Tomography (EIT), Prof. Frangi moved to 3D image processing of angiographic and cardiac images. 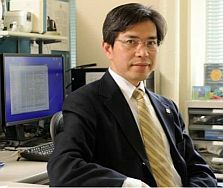 Currently he is particularly interested in applications of image analysis and computer vision to medical image computing and the connection of imaging with physical models to develop personalized computational models of the cardiovascular system. As part of his PhD defense Mr. Dipl.-Inf. 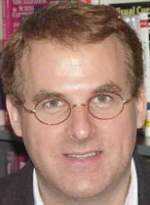 Hauke Heibel will give a talk on May 2, 2011 at 2.00 p.m. in Room 03.13.010 of FMI-Building, Garching, Boltzmannstr. 3. 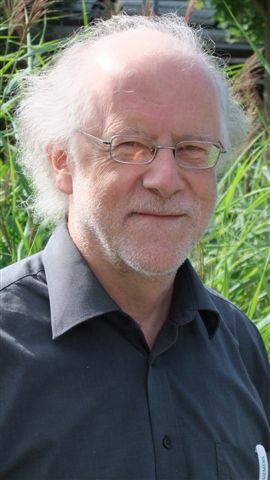 Dr. Mertelmeier received his Diplom in Physics in 1981 and his PhD degree in theoretical Nuclear Physics in 1985 both from University of Erlangen-Nürnberg. 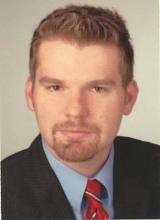 In 1986, he joined Siemens AG Healthcare (formely Medical Solutions) in Erlangen and is since then affiliated with it. During 1995 and 1996 he spend some time in Rochester, NY, USA as visiting researcher. As Senior Principal Scientist, Dr. Mertelmeier is currently in charge of innovation in the Siemens Healthcare business unit X-ray Products. As part of his PhD? defense Mr. Dipl.-Inf. 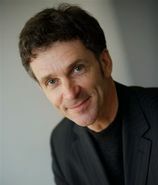 Peter Keitler will give a talk on April 12, 2011 at 14.30 in Room 03.13.010 of FMI-Building, Garching, Boltzmannstr. 3. As part of her PhD defense Mrs. Dipl.-Inf. 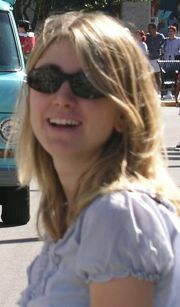 Stefanie Demirci will give a talk on April 12, 2011 at 9.00 a.m. in Room 03.13.010 of FMI-Building, Garching, Boltzmannstr. 3. We got an Outstanding Paper Award at the 9th IEEE Conference on Automatic Face and Gesture Recognition 2011 for a paper by L. Schwarz, A. Mkhitaryan, D. Mateus and N. Navab. After having already received an award at the Munich Business Plan Competition, our business plan on AXSight has also been awarded in the Germany-wide Science4Life competition. Prof. Marc Pollefeys from the computer vision lab at the ETH Zurich is giving a invited Talk about 3D shape and motion extraction from images. The purpose of this presentation is to outline key clinical challenges and research opportunities for developing the next generation minimally invasive surgical robots and the associated image guidance techniques. The talk will cover the latest developments in fully articulated, bio-inspired (e.g. 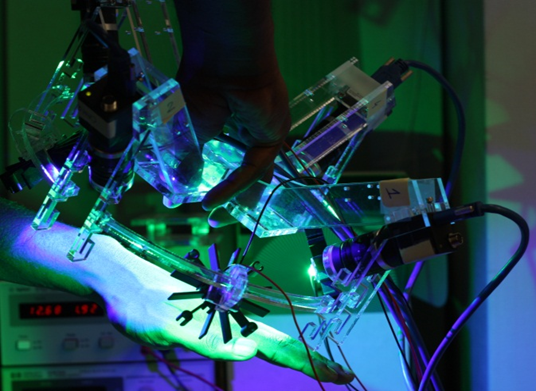 Snake) robot platforms that facilitate intra-luminal or extra-luminal anatomical curved pathway navigation with integrated sensing and navigation. 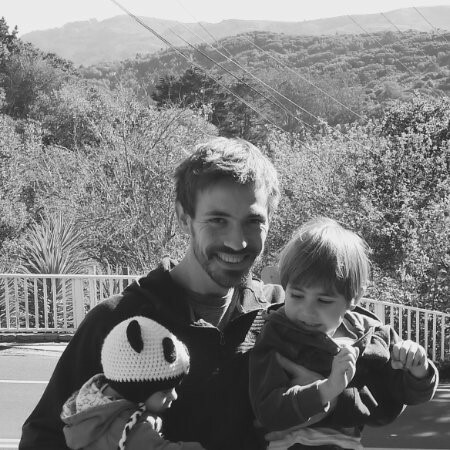 Julian Stoettinger from CV Lab at TU Vienna (Austria) will give an invited talk on Detection and Evaluation Methods for Local Image and Video Features. Within one week the video on our project of an Augmented Reality Magic Mirror using the Microsoft Kinect reached over 150,000 views on YouTube. 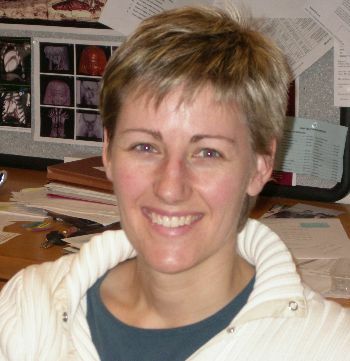 Dr. Noël will give a talk on "Clinical and Academic Reconstruction Algorithms for X-ray Computed Tomography". 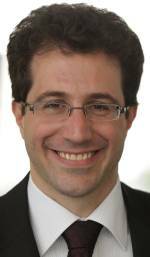 In an invited talk at the CAMP lecture, Dr. Yigal Shoshan will describe clinical applications of fMRI and DTI, for example in pre-surgical planning or brain tumors surgery. Three-dimensional user interfaces are popular in movies and games. In that respect Prof. Dr. Wolfgang Stürzlinger will present innovative solutions based on the capabilities and limitations of both humans and technologies. Christoph Bichlmeier will defend his PhD thesis with the title Immersive, Interactive and Contextual In-Situ Visualization for Medical Applications. 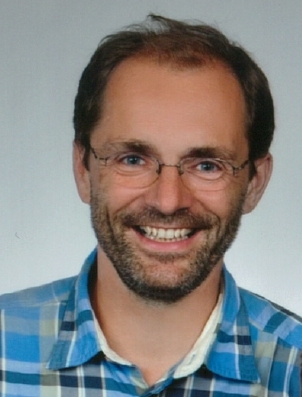 In an invited talk at the CAMP lecture, Prof. Joachim Hornegger, PhD, University of Erlangen, will present several novel approaches to cardiax reconstruction algorithms and an overview of initial experimental results. Florent Brunet will defend his PhD thesis with the title „Contributions to Parametric Image Registration and 3D Surface Reconstruction”. 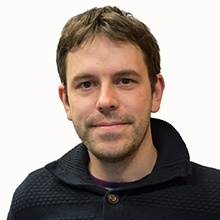 In an invited talk at the CAMP lecture, Stéphane Côté, PhD, Southampton University, UK, will present the Bently Systems, a software development company dedicated to substaining infrastructure. Furthermore there will be a brief description of its Applied Research group. The members of the microDIMENSIONS team of our group (Martin Groher, Marco Feuerstein, and Hauke Heibel) were awarded an EXIST-Forschungstransfer grant by the Bundesministerium für Wirtschaft und Technologie. 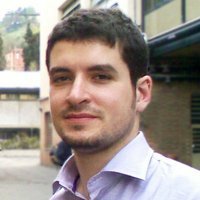 Razvan Ionasec will defend his PhD thesis with the title "Patient-specific Modeling and Quantification of the Heart Valves from Multimodal Cardiac Images". 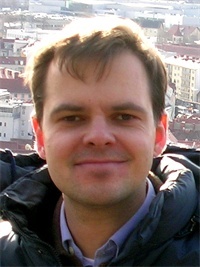 Kilian M Pohl is as an Assistant Professor at the Section for Biomedical Image Analysis, Department of Radiology, University of Pennsylvania. 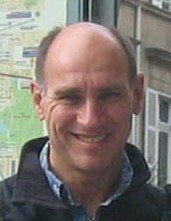 His main research area is computational image analysis with an emphasis on studying statistical models from a Bayesian perspective. In his talk he will develop a new curve evolution formulation for estimating the posterior distribution of objects in images. Together with colleagues from other groups, we are organizing a Tutorial on Intensity-based Deformable Registration at MICCAI 2010. The prestigious SMIT Technology Award goes to Professor Navab for outstanding contributions of the chair for computer aided medical procedures to computer assisted surgery through the development of Freehand SPECT and Camera-Augmented Mobile C-arm (CAMC). The award was delivered by the general chairs of the SMIT annual conference held in Trondheim, Norway. 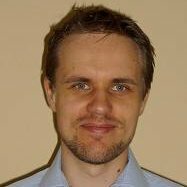 Andreas will defend his PhD thesis with the title "Dynamic Variational Level Sets for Cardiac 4D Reconstruction". We got the Best Supplementary Material Prize at the 21st British Machine Vision Conference (BMVC), for a video submitted together with our paper by Loren Schwarz, Diana Mateus, Victor Castañeda and Nassir Navab. 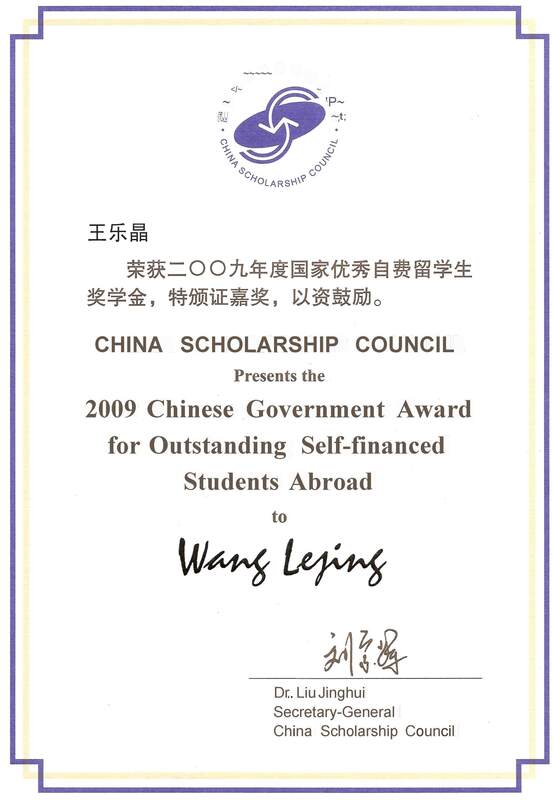 We are very happy to announce that Lejing Wang got the 2009 Chinese Government Award for Outstanding Students Abroad. 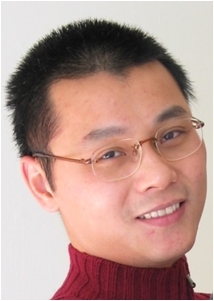 Lejing Wang receives financial support from Technische Universität München for his PhD study. 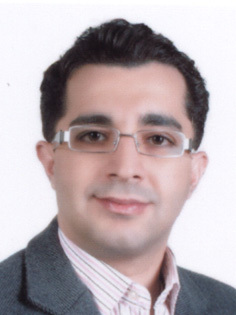 Arash Taki will defend his PhD thesis with the title Improvement and Automatic Classification of IVUS-VH (Intravascular Ultrasound – Virtual Histology Images). 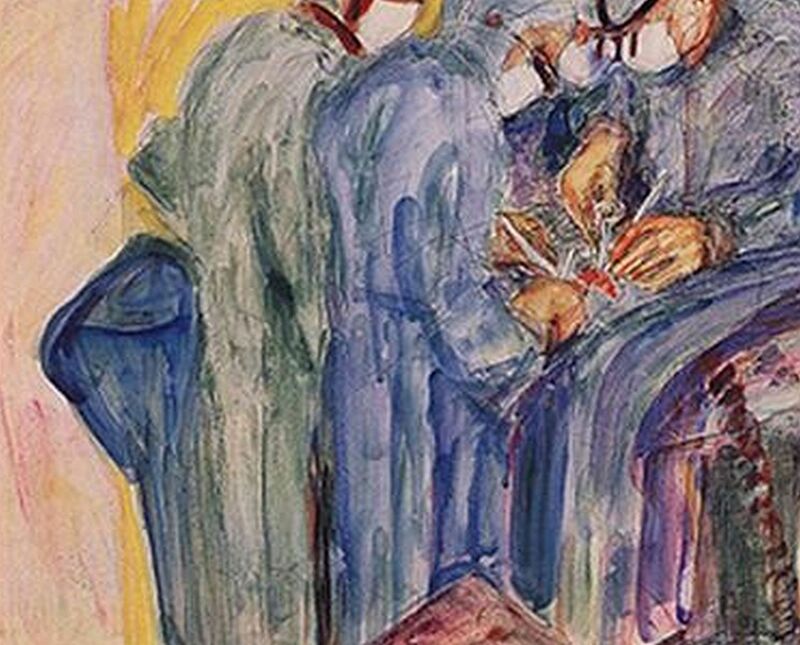 In this talk, Dr. Kamen will outline a collection of Siemens intramural and NIH funded projects responsive to the current trends in both diagnostic and interventional settings. We got the best paper award at the VI International Conference on Articulated Motion and Deformable Objects (AMDO). L. Schwarz, D. Mateus, N. Navab. Invited speakers and members of the CAMP chair will give a series of talks on modeling of the human heart and recent research on ultrasound imaging. Oliver Kutter will defend his PhD thesis with the title Visual Computing for Computer Assisted Interventions. Talk by Ovgu Ozturk from the University of Tokyo on multiple-human tracking from a single camera with the aim of analyzing human behavior in public places. Nicolas will defend his PhD thesis with the title Workflow and Activity Modeling for Monitoring Surgical Procedures. Prof. Dr. Soheyl Noachtar, head of the Epilepsy Center at the Neurological Clinic of LMU in Großhadern, will give a talk on Motion analysis for epilepsy patients. Dr. med. Kai Bötzel from the department of Neurology of Klinikum Grosshadern will give a talk on Deep Brain Stimulation for Movement Disorders. 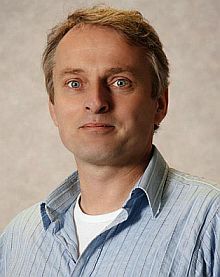 Tobias Höllerer is an Associate Professor of Computer Science at the University of California, Santa Barbara, where he co-directs the Four Eyes Laboratory, conducting research in the four I's of Imaging, Interaction, and Innovative Interfaces. Die Zukunft heißt Augmented Reality - zu deutsch: Erweiterte Wirklichkeit. Das heißt: Virtuelle und echte Welt wachsen zusammen. In der Medizin soll das zum Beispiel minimalinvasive Operationen ermöglichen. Doch auch im Alltag hat die Augmented Reality schon Einzug gehalten: Die Kombination modernes Handy plus Software verspricht allerlei nützliche Hilfestellungen für Jedermann, etwa bei der Wohnungssuche oder auf Reisen. PLANETOPIA hat getestet, wie gut die neue Technik ist und ob sie bereits für den Alltag taugt (Planetopia Homepage, Dez 2009). I will present a model-based approach to 3D hand tracking from monocular video. The 3D hand pose, the hand texture and the illuminant are dynamically estimated through minimization of an objective function. Derived from an inverse problem formulation, the objective function enables explicit use of texture temporal continuity and shading information, while handling important self-occlusions and time-varying illumination. Dr. Andrey Samorodov's presentation describes work directions of the Chair for Biomedical Technique and R&D Center of Biometric Technology of Bauman Moscow State Technical University. Come and visit our interdisciplinary NARVIS Lab at Klinikum Innenstadt and experience our Medical Augmented Reality systems. If you are looking for an exciting bachelor-, master thesis (students) or a research project in our field you plan to setup (physicians, researchers, businessmen, technique freaks, ... ), come by and talk to us! See you there! We got the best paper award sponsored by IBM at the ICCV 2009 Workshop on Video-oriented Object and Event Classification (Kyoto - Japan, September 2009) for our paper Workflow Monitoring based on 3D Motion Features. N. Padoy, D. Mateus, D. Weinland, M.O. Berger, N. Navab. 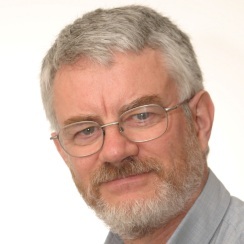 Prof. Terry Peters, PhD, Professor for Medical Imaging and Medical Biophysics at Robarts Research Institute, University of Western Ontario, London, Canada, will give an invited talk on VR-Guidance of Minimally Invasive Beating Heart Interventions. Prof. Nassir Navab and Prof. Thomas Ertl gave keynote speeches at CEIG'09 (Congreso Español de Informática Gráfica). 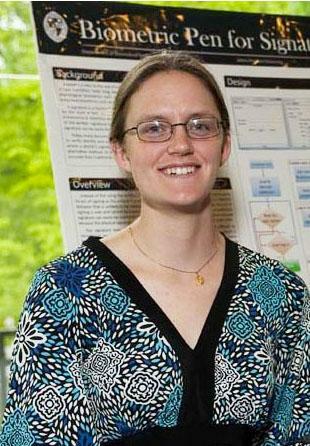 Prof. Rebecca Fahrig, PhD, Associate Professor (Research), Dept. of Radiology, Stanford University, Stanford, CA, U.S.A., will visit our labs and present some of the projects of her lab. In this talk, Prof. Paragios will present recent development in the field of efficient linear programming using the primal dual principle towards solving generic MRFs of pair or higher order interactions and their applications in medical imaging and computer vision. 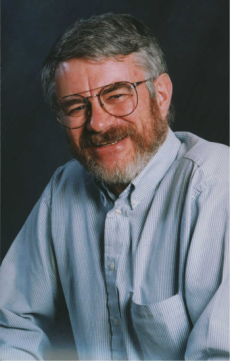 Prof. W.R. Madych, Professor for Harmonic Analysis at the Department of Mathematics at the University of Connecticut, will give a talk on Inverse problems, ill posed and ill conditioned problems, and resolution. 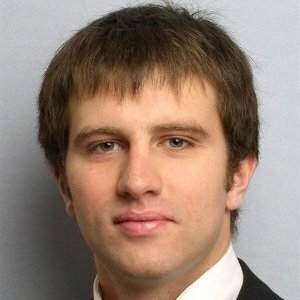 Dr. Christian Sandor is the Deputy Director of the Wearable Computer Lab at the University of South Australia and will talk about the porblems of taking AR systems out laboratory environments into the real world. After extensive preclinical testing finally CAMC has been moved into the Operation Room of Innenstadtklinikum at Nußbaumstraße. First 4 Patients were treated successfully with CAMC-navigation support. The clinical investigation will cover 120 surgeries in Orthopedic Trauma Surgery. Professor Navab and many clinical partners believe that in a few years CAMC will take over the current market of existing mobile C-arms. One of the most fundamental computer vision problems is image matching. We focus on the interesting case of two images of a continuous surface. Prof. Dr. Noachtar, head of the Epilepsy Center at the Neurological Clinic of LMU in Großhadern, gives a talk on Treatment of Epilepsy and Motion Analysis for Assessment of Epileptic Seizures. From 9th to 12th of June we successfully hold our workshop on Advanced Imaging and Visualization at Lago d'Iseo in Italy. Follow the link for an overview, the scientific program, and some pictures. This talk describes the accomplishment of the Time-of-Flight (ToF?) measurement principle via endoscope optics. The articles Dense image registration through MRFs and efficient linear programming and Automatic CT-ultrasound registration for diagnostic imaging and image-guided intervention are ranked on the 2nd and 4th place in the list of most downloaded articles. Prof. Navab will give a talk on Action- and Workflow-driven Augmented Reality for Computer Aided Medical Procedures within the symposium of BAdW Forum Technologie. This Thursday there is a symposium on Navigation within the ‘250 years of Bayerische Akademie der Wissenschaften’. In the morning some of the best students of German high schools are coming to visit our hospital research labs. They will visit the IFL to see both live demos there and other demos transmitted direct over video conference from our NARVIS laboratory at Klinikum Innenstadt, LMU. Invited Talk on Medical image classification: the cases of cancer area characterization and brains in Schizophrenia research. In this invited talk, Ali Khamene will introduce his work on a new optimization method for the 2D-3D image registration problem. In collaboration with docmed.tv, which is a web based multi-media platform for communicating advances in the field of health care, we created a video showcasing the ongoing research at NARVIS lab. NARVIS lab is located at Klinikum Innenstadt in Munich and run by the department of trauma surgery, LMU, Munich and our chair. Watch the full report. How to write a proposal for FP7 and get it accepted. Dr.med.,Dr.rer.nat. 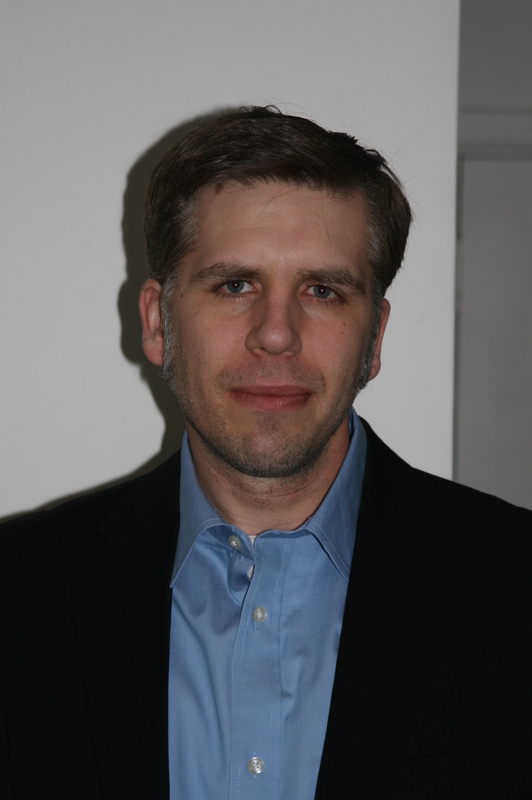 Axel Wismueller (Associate Professor for Radiology and Biomedical Engineering, University of Rochester, New York) will be giving an invited talk about his work. Dr. Thomas Lango , senior researcher and group leader at SINTEF will give an invited talk on 3D Ultrasound Navigation for Neurosurgery. The talk will be at hospital rechts der Isar within our multidisciplinary research laboratory IFL. In the course of the lecture "Computer Aided Medical Procedures" (Prof. Navab), we'll have one invited talk by Prof. Franjo Pernuš, PhD. 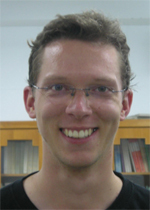 Daniel Weinland, postdoctoral fellow at the Ecole Polytechnique Federale de Lausanne, will give an invited talk about his work on action representation and recognition. 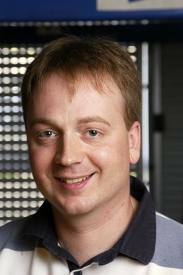 Jochen Penne from Joachim Hornegger's group in Erlangen will be visiting us on Thursday the 27th of November. 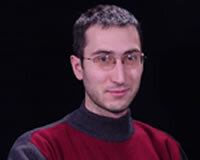 He will give a talk about his work on TOF-cameras and their use in the operation room. The talk will take place at 10:00 in 03.09.014. Prof. Dawant is visiting us in the course of the ROBOCAST project, as an external expert on computer-aided placement of Deep Brain Stimulation (DBS) electrode probes. In the CAMP lecture, he will give a presentation on the methods developed at their Medical Image Processing Laboratory at Vanderbilt University for advanced DBS procedures. VITEC Camera Dynamics is a branch of VITEC Corp., hosting several sub-brands which provide professional equipment for the entertaining and broadcasting industry. Represented by Ali Ahmadi (Product & Marketing Manager), Richard Lindsay (Head of Innovation) and Chris O'Neill (Director of Manual Products), the talk will give an overview over current products and innovations at VITEC Camera Dynamics. Feel free to join and get informed about one of the world leading companies in professional camera and studio equipment. Since 1994, IRCAD-EITS has made itself known as a prestigious center of excellence in the fields of basic and applied research, and new surgical technologies. The reputation of IRCAD-EITS contributes to position this unique institute among the top surgical training centers in the world. 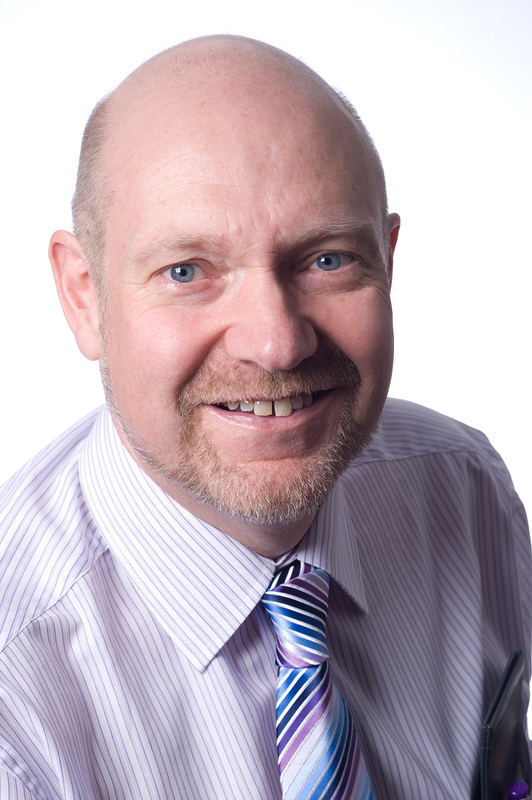 Prof. David Hawkes is the Director of the Centre for Medical Image Computing (CMIC) at University College London. 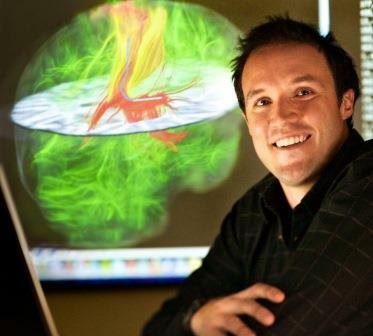 His talk on Model Guided Therapy will give an overview of his current research interests, including image matching, data fusion, visualization, shape representation, surface geometry, and modelling tissue deformation. Last but not least Joerg Traub will defend his PhD thesis entitled New Concepts for Design and Workflow Driven Evaluation of Computer Assisted Surgery Solutions. 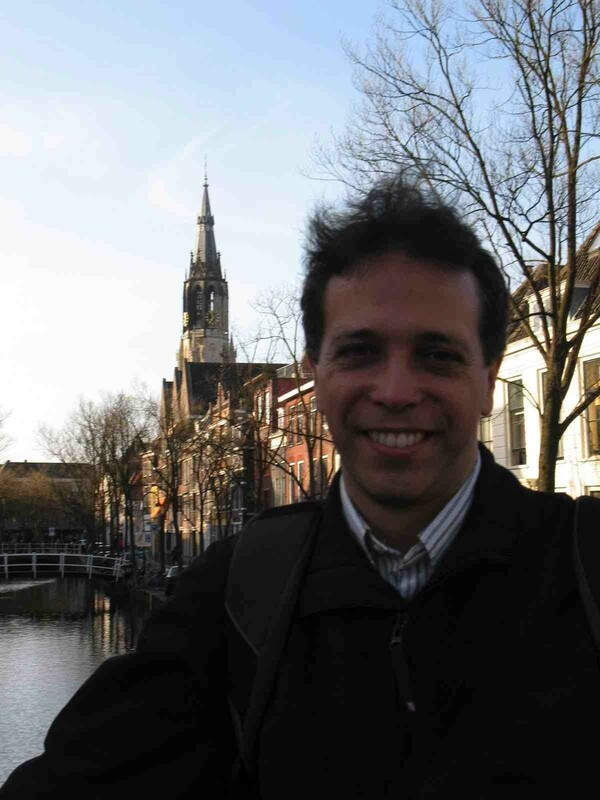 Shahriar Negahdaripour, Professor at the University of Miami will give a talk on Fusion of optical and sonar image measurements for automating visual tasks in underwater. 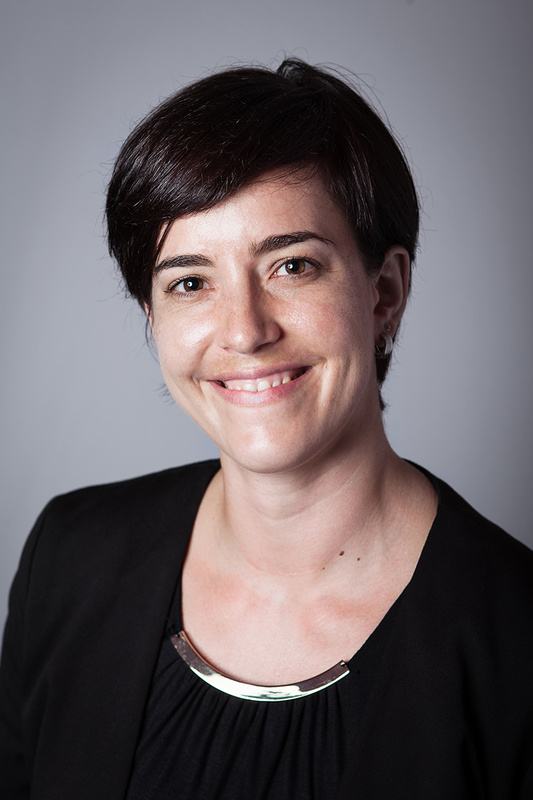 We are happy to announce, that Diana Mateus started at CAMP as a postdoctoral fellow. Diana comes to us after completing an excellent doctorate thesis at INRIA Rhone-Alpes. 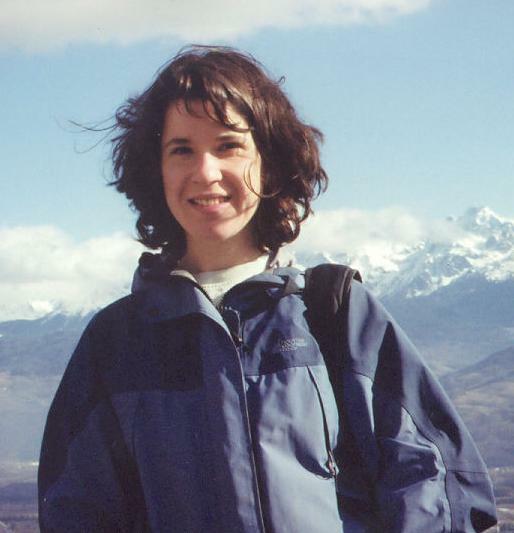 You can find more about her by visiting her homepage at INRIA until she sets up her new web-site at CAMP. Welcome Diana! CAMP is proud to present another PhD graduate. Ruxandra Lasowski successfully defended her dissertation with the topic 'Visualization modes for CT-fluoroscopy guided RF liver ablation'. With near 700 downloads in less than three months, Ben Glocker's paper on Dense image registration through MRFs and efficient linear programming is leading the Top25 ranking for the Hottest Articles in Medical Image Analysis. Prof. Nassir Navab is an invited speaker at International conference on Medical Imaging and Augmented Reality in Tokyo, Japan. For more information please visit the conference web-site (http://www.miar.org/2008/). Stefan Hinterstoißer, Tassilo Klein and Tobias Blum won the Werner von Siemens Excellence Award 2008. In der Medizin existieren große Archive mit heterogenen Bilddaten, die für Diagnostik, Therapie und Forschung automatisch indiziert werden müssen. 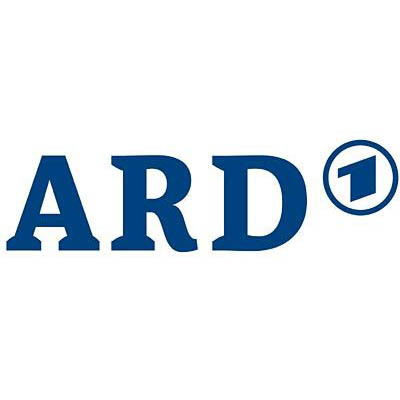 Da beim Archivieren eines Bildes der Kontext einer späteren Suchanfrage noch nicht bekannt ist, werden mit einem hierarchischen Segmentierungsverfahren Multiskalenmerkmale vollständig extrahiert und in einem Graphen gespeichert. Dr. Cordelia Schmid is giving a talk on Learning visual human actions from movies within our faculty on Friday July 18 at 12:00 am at MI 00.13.009 in Garching. An interactive segmentation refinement system can overcome the problem by reusing erroneous automatic segmentations by providing efficient tools and an intuitive user interface to correct them. An example designed for but not limited to liver segmentation in the context of virtual liver surgery planning will be presented. Prof. Richard Hartley, one of the most cited scientist in Computer Vision, is giving a talk within our faculty. He will discuss algorithms for finding the motion of a multi-camera rig such as a set of fixed cameras mounted on a moving vehicle, without significant overlap between the cameras' fields of view. 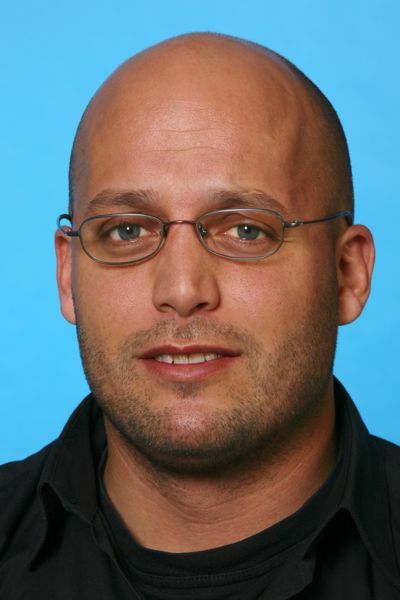 Prof. Carlo Tomasi from Duke University is going to give a talk at the Department of Computer Science at the Friedrich-Alexander-University (Erlangen-Nuremberg). The talk will be transmitted to us via tele-conference. The NA-MIC, Harvard Medical School, and CAMP, TU Munich, are currently hosting the NA-MIC Kit and Slicer3 Workshop at the IHK-Akademie in Westerham-Feldkirchen. The hands-on workshop is aiming at the introduction of the components of the NA-MIC kit and the capabilities of Slicer3. The workshop, sponsored by DFG, is a collaboration of NA-MIC, Kitware and CAMP. We are honored that Dr. Radu Horaud (leading the Perception a research group at INRIA Grenoble Rhône-Alpes, France) accepted the invitation of " CoTeSys cluster of excellence " in order to give a talk. 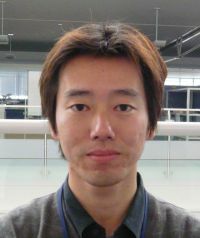 Fumihisa Shibata, associate professor at the Department of Information and Communication Science College of Information Science and Engineering, Ritsumeikan University, Japan will give an introduction of his laboratory and his research projects. Dorin Comaniciu, Leiter des Integrated Data Systems Department bei Siemens Coorporate Research Princeton, NJ) wird im Rahmen der morgendlichen Fortbildungsveranstaltung der Herzchirugie einen Vortrag geben. 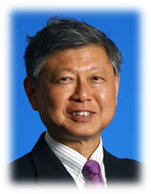 Our CAMPing this year will be a joint seminar of the CAMP Chair together with the Royal Society/Wolfson Medical Image Computing Laboratory at Imperial College under the supervision of Professor Guang-Zhong Yang who will join us with a group of around 15 people. 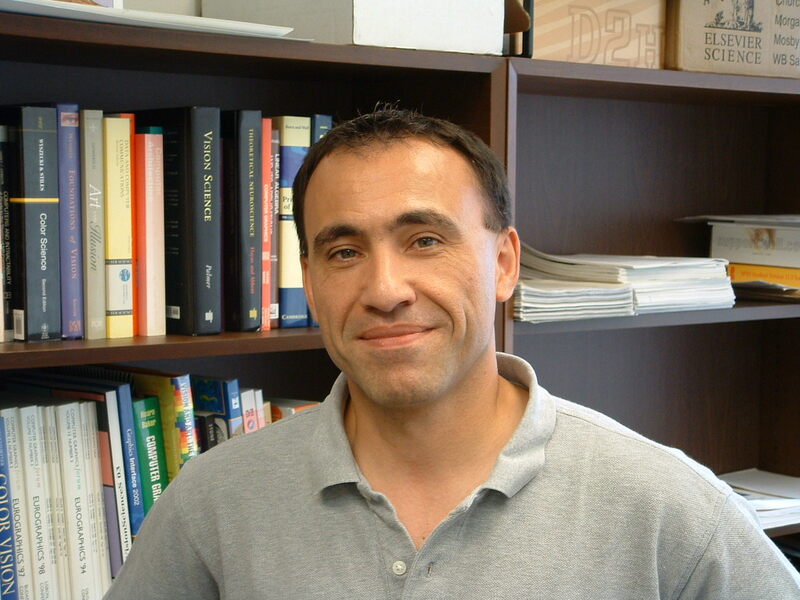 In the course of the lecture "Computer Aided Medical Procedures II" (Prof. Navab), we are honored to have an invited talk by Prof. Ioannis A. Kakadiaris (Computational Biomedicine Lab, University of Houston). CAMP's research assistant Martin Groher is defending his dissertation. 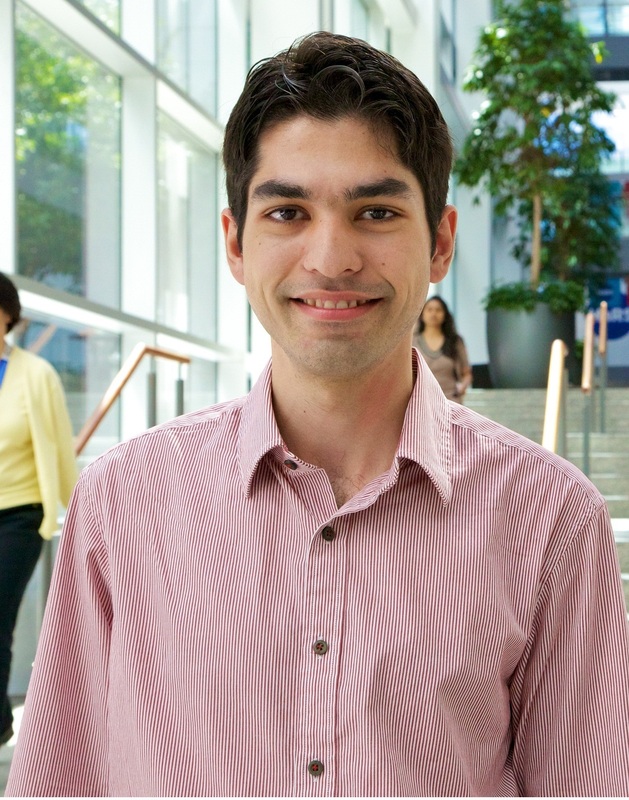 The topic of his thesis is '2D-3D Registration of Vascular Images Towards 3D-Guided Catheter Interventions'. 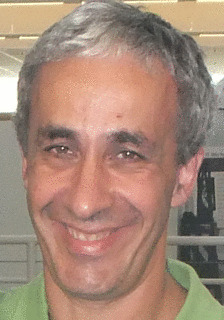 Nassir Navab has joined the Editorial Board of Medical Image Analysis. MIA is one of the two most prestigious journals in the field of medical imaging and computer aided interventions. This journal has an impact factor of 3.256. We're proud to announce that our young colleague Ryu Hilla will receive the CAMP Award for extraordinary social skills and his/her recent excellent results. Prof. Nassir Navab gave an Invited Talk at ECR2008 about the future of Image Guided Intervention. CAMP's research assistant Tobias Sielhorst is defending his dissertation. The topic of his thesis is 'New Methods for Medical Augmented Reality'. CARS is an event in which the international community in computer aided surgery and radiology meets. Despite its high rate of acceptance, the strong presence of international groups makes the event particularly interesting. CARS is also one of the only conferences including special sessions on medical workflow. This year we have two long papers in this field. We also have one long and one short accepted papers on IVUS-VH imaging. The talk gives an overview on the activities in medical robotics at the Institute for Process Control and Robotics (IPR) at the University of Karlsruhe (TH). The research work covers the complete work flow starting with imaging over image processing, 3D reconstruction, surgical planning, simulation to introperative techniques. To support the surgeon in the operation theatre robotics devices and systems for augmented reality are in the focus of the research. ROBOCAST is an international European Union supported project, which aims at developing ICT scientific methods and technologies, which focus on robot assisted keyhole neurosurgery. The Chair for Computer Aided Medical Procedures & Augmented Reality is one of the project partners contributing to the project in the areas of surgical planning, intra-operative navigation, dynamic accuracy analysis and advanced visualization during the intervention. From 18-19. January 2008 the official project Kick-off meeting took place at Politecnico di Milano, with presentations from all project partners. Prof. Dr. Nassir Navab gives an invited talk at the lecture series of IST, the National Center for Simulation and UCF's new College of Medicine at University of Central Florida in Orlando. We're proud to announce that Thomas Wendler won this year's DAAD award for his excellent scientific achievements and social skills in international relationships. Thomas Wendler and Eric Soehngen won the 1st price at the Intel-UC Berkeley Technology Challenge (IBTEC) international business-plan competition. Additional picture and information after the jump. 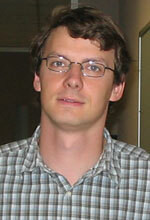 Wolfgang Wein wins the MICCAI Young Scientist Award 2007 in the category Visualization and Interaction. Here is the quotation from the selection committee: This is a highly original contribution to the difficult problem of US to CT registration. In particular, the use of knowledge of simple US physics to generate an image with characteristics representative of clinical US images is highly innovative. Christian Wachinger and Ben Glocker won this year's Werner von Siemens Excellence Award. We are very happy to announce that Selim Benhimane got the Price for the Best French Ph.D. Thesis of the last 2 years (2005-2006) in Applied and Innovative Research from the ASTI. The ceremony was in Paris (7th of November 2007) at Cité des Sciences de La Villette. As an extension the camera augmented mobile c-arm system by Navab et al. 1999 we developed a multi-view system which offers 3D navigation during trauma surgery and orthopedic procedures. We use an additional video camera in an orthogonal arrangement to the first video camera and a minimum of two X-ray images. CAMP is proud to present its first PhD graduates. After the defense talks ('Augmented Reality in Laparoscopic Surgery - New Concepts for Intraoperative Multimodal Imaging' & 'Multimodal Integration of Medical Ultrasound for Treatment Planning and Interventions') we will have a party in the IFL Lab on Oct 15, 5pm. CAMP's research assistant, Marco Feuerstein is defending his dissertation. The topic of his thesis is 'Augmented Reality in Laparoscopic Surgery - New Concepts for Intraoperative Multimodal Imaging'. CAMP's former research assistant, Wolfgang Wein, now working for Siemens Corporate Research, is defending his dissertation. 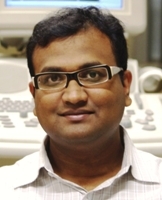 The topic of his thesis is 'Multimodal Integration of Medical Ultrasound for Treatment Planning and Interventions'. From Sep 23 to Oct 5, we tutored a group of 14 students during Ferienakademie in Sarntal, Italy. SZ Article about CAMP Research at Klinikum Innenstadt addressing the projects Camera Augmented Mobile C-arm, Improving Depth Perception and Perception of Layout for In-Situ Visualization in Medical Augmented Reality and 3D user interfaces for medical interventions. CAMPAR's former research assistant, Martin Bauer from the FAR research team is defending his dissertation. The topic of his thesis is 'accuracy analysis in optical tracking systems and error propagation for augmented reality'. CAMP is providing a scholarship for a two years doctorate position in Spain for extremely talented students. CAMP is announcing a Medical Imaging as Art (MIA) contest. We are now accepting submissions. We'd like to invite you to visit our new lab at Klinikum Innnenstadt on the 8th of August at 6 p.m.. According to the design ideas and suggestions of Christopher Stapleton we developed a creative and collaborative platform for further research projects in the medical field in close collaboration with our medical partners. The new lab is located right next to the ORs and provides space for all kind of activity. It was designed to serve as a lecture room, a show room, a workshop but also as a conference room. We would like to invite everyone to come to the seminar room MI 03.13.010 at 16:00. 4 Teams of the course Projekt Systementwicklung Bildverarbeitung und Computer-Graphik mit C++ will present their final projects. Supported by Sandro Michael Heining (M.D.) and Christopher Stapleton the students developed different game concepts with medical topics. CAMP proudly presents the final movies of the lab course 3D Computer Vision and special effects. This year we will have an even bigger variety of special effects than last year. Get excited by short movies augmented by 3D computer vision effects such as Mosaicking, 3D reconstruction, Terminator effect, Matrix effect, 3D Tracking, etc... Consumption of Coke and Popcorn is permitted. The final movies can be found on the homepage of the lab course. This presentation will be on conducting transdisciplinary research collaboration to enhance core technology that needs to transfer across applications. In reaching a state of constant innovation, there needs to be a more experimentation on innovating the innovation process itself to encourage more diverse thinking to reach more novel insight more effectively. Discussion will be on ways to encourage the collaboration of diverse fields of study here at CAMP. 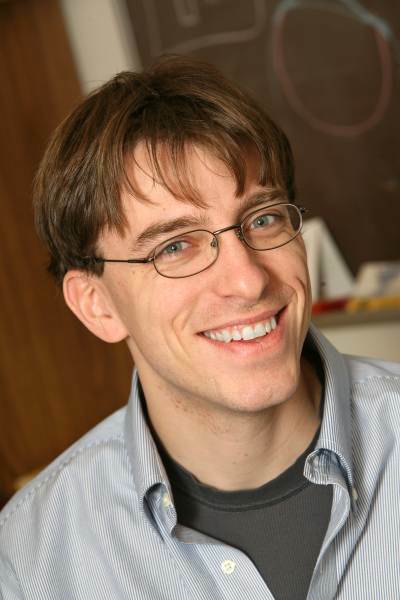 We are proud to announce that Ben Glocker won this year’s Francois Erbsmann Prize at the Conference on Information Processing in Medical Imaging 2007. From 1st to 6th of July 2007, 18 Nobel Laureates in Physiology or Medicine were meeting over 500 of the worlds most talented young scientists of tomorrow. The participants were discussing current scientific issues during the course of lectures, seminar discussions and numerous personal encounters. Moritz Blume a doctorate candidate at CAMP was selected and got the exceptional opportunity of participating in this event. 6 July 2007, NARVIS lab, Klinikum Innenstadt 1 p.m.
Kevin Cleary, research associate professor and deputy director of Georgetown University Medical Center, will give a talk about the latest research on physician-assist systems for precision placement and manipulation of medical instruments during minimally invasive procedures. The characterization of respiratory motion and compensation for respiratory motion are also research thrusts. Once again hard and intelligent collaborative work has been paid off. The last year success was remarkable and this year we have gone even further. We have 14 papers accepted at MICCAI 2007! MICCAI is based on full paper submissions and double blind review process in which each paper receives at least 6 peer reviews. MICCAI 2007 received 637 papers submissions. Only 237 got accepted (35% acceptance rate). CAMP is presenting at CARS 2007, Computer Assisted Radiology and Surgery, 21st International Congress and Exhibition, June 27 - 30, 2007 in Berlin, Germany. A group of PhD students form the Research in Medical Imaging group of Prof. Gábor Székely of the Computer Vision Laboratoy of ETH Zürich are visiting CAMP. There will be presentations on various research issues. 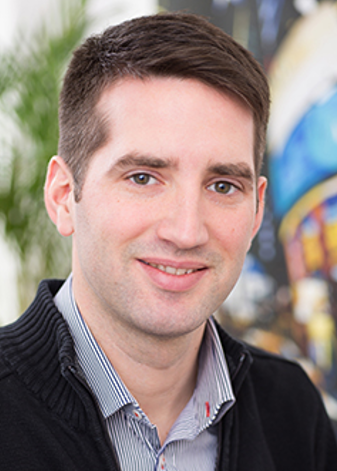 We'd like to introduce Christopher Stapleton, affiliate professor of the University of Central Florida’s Institute for Simulation and Training, who will join us during his sabbatical year. His talk will be at 4 p.m. in our seminar room MI 03.13.010. 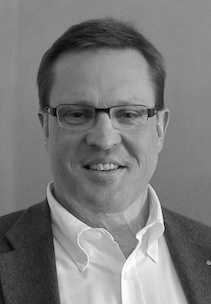 We're proud to announce that Christopher Stapleton joins the CAMP chair as a Guest Professor for 3 months. An article Virtueller Blick in den Körper about our medical AR activities was published in the Handelsblatt on May 8th 2007. Read the full article at the Handelsblatt homepage. An article about Advanced visualization in the operating room; published in the MED & LAB Engineering Magazine. The full text can be found here. An article Erweiterte Realität: Verschmelzung zweier Welten about our medical AR activities was published in Deutsches Ärzteblatt 104, Ausgabe 13; Seite A-840 by Merten, Martina. Read the full article at the DÄ homepage (PDF). A meeting of the MBI group of the DKFZ Heidelberg with our CAMP group. Special focus will be on a common software platform and joint projects in the future. We're proud to announce that Pierre Georgel won this years Innovation Award from the AREVA NP GmbH for his Development of an Augmented Reality System for Descrepency Check between built Plants against their CAD Model. Dr. Adrien Bartoli from the LASMEA laboratory in Clermont-Ferrand, France is is giving an invited talk on Feature-Driven Direct Non-Rigid Image Registration. Since its introduction as a means of front propagation and its first application to edge-based segmentation in the early 90's, the level set method has become increasingly popular as a general framework for image segmentation. In this talk, I will present several contributions to this framework. Prof. Gabor Szekely from the Computer Vision Laboratory, ETH Zürich, is giving a talk on Virtual and Augmented Reality Based Simulation for Surgical Skill Training. Prof. Luc Soler from the Department of Digestive and Endocrine Surgery, University Hospital, Strasbourg, is giving a talk on Virtual Reality and Robotics for Detection and Treatment of Abdominal Cancer in animal preclinical studies and clinical use. 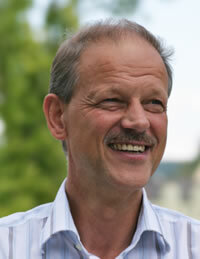 Prof. Dr. Karl Heinz Höhne will give a talk on "Simulation materialabtragender chirurgischer Eingriffe". The Chair for Computer Aided Medical Procedures and the labaratory Mathématiques Appliquées aux Systèmes at Ecole Centrale Paris have a student exchange program. Like in the years before, we'll once again organise a christmas party. This time, it will take place in the Klinikum Innenstadt. More informations can be found in the newspost. Don't forget to invite and sign up our medical and industrial partners as well as other people involved with the CAMP chair. VDI article about Tobias Lasser, Darko Zikic and Christoph Bichlmeier. 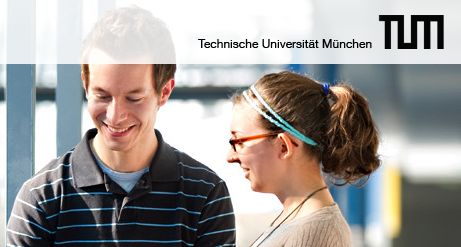 Article about the winners of the Siemens Excellence Award 2006 of TU München on the VDI page. We are proud to announce that Nassir Navab will be a member of the MICCAI board. You can find detailled information in this newspost. In the course of the lecture "Computer Aided Medical Procedures" (Prof. Navab), we'll have two invited talks by Prof. Gabor Fichtinger, PhD and Chenyang Xu, PhD. An article from the Süddeutsche Zeitung about Tobias Lasser, who studied one year at Harvard, Boston and is now doing his PhD at the CAMP chair - TUM. Darko Zikic, Tobias Lasser and Christoph Bichlmeier, three students of the CAMP chair, won this year's Werner von Siemens Excellence Award. Daniel Pustka, Manuel Huber and Martin Bauer won this year's Honorable Mention Student Paper Award at the ISMAR 2006 conference. Two papers, which were written by Marcus Tönnis in conjunction with the Ergonomic researchers from the Faculty for Mechanical Engineering won best paper awards. This year we have 3 paper presentations and a demo presentation at the 5th IEEE and ACM International Symposium on Mixed and Augmented Reality. Television broadcast about the Open Day at TUM features research from CAMP&AR. AMI-ARCS 2006, a one day satellite workshop of MICCAI 2006, will serve as a forum for researchers involved in all aspects of Augmented environments for Medical Imaging including Augmented Reality in Computer-aided Surgery. 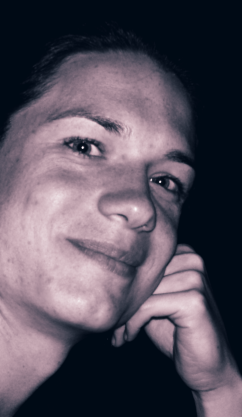 We are happy to introduce a new member at the CAMP chair: Stefanie Kettner. She will join the Chair for Computer Aided Medical Procedures as a Ph.D. student and will work on a Medical-Aided Surgery project in coorporation with Deutsches Herzzentrum München. The next CAMPing weekend takes place on Sept. 21st to Sept. 23rd 2006. The first Iranian-German workshop on medical engineering is designed to be a collaborative platform for intense exchange of scientific and cultural interests. The subjects of the workshop will cover various fields of engineering in medicine including medical image segmentation and registration, workflow and healthcare, robotics, and simulations. Jun. Prof. Dr. Oliver Bimber: No Screens Required! Final Video Assignments of 3D Computer Vision Lab course online. 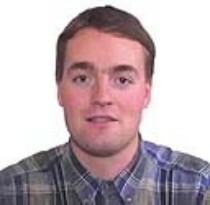 Please see at http://campar.in.tum.de/Chair/TeachingSs06CVLabCOurse -> Final Video Assignment and have fun. Bayern Alpha has once a month a reportage called Alpha Campus. This magazine is mainly about the current research and teaching at the Bavarian universities. The July edition deals with the computer science studies at TUM and LMU. For that, the Bayern Alpha team recorded in the CAMPAR labs. .. says Prof. Gudrun Klinker at the Munich Scientific Film Festival (Wissenschafts-Filmfest) in an interview with the newspaper Münchner Merkur. Computer Vision Workshop with the talks from Dipl. Inf. Andreas Hofhauser, Ph.D. Giorgio Panin, Dipl. Inf. Wolfgang Sepp and Dr.-Ing. Didier Stricker. Computer Vision Workshop with the talks from Irfan Essa, Vincent Lepetit, Matthias Grundmann and Andreas Hofhauser.